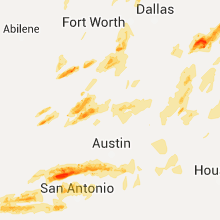 The Cresson, TX area has had 8 reports of on-the-ground hail by trained spotters, and has been under severe weather warnings 25 times during the past 12 months. 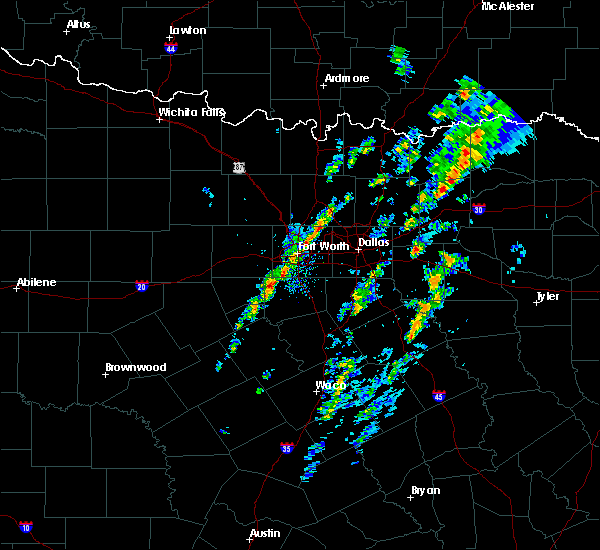 Doppler radar has detected hail at or near Cresson, TX on 56 occasions, including 4 occasions during the past year. 4/17/2019 10:27 PM CDT The severe thunderstorm warning for somervell, southwestern parker and hood counties will expire at 1030 pm cdt, the storms which prompted the warning have weakened below severe limits. therefore the warning will be allowed to expire. however gusty winds are still possible with these thunderstorms. 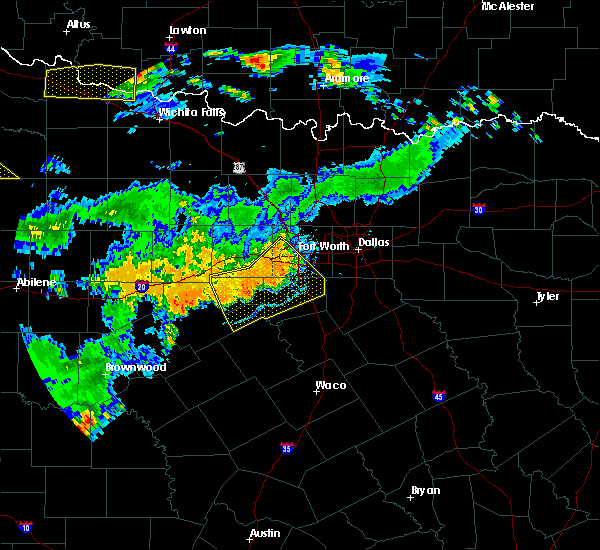 a severe thunderstorm watch remains in effect until 200 am cdt for central and north central texas. 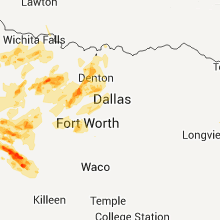 4/17/2019 10:12 PM CDT At 1011 pm cdt, severe thunderstorms were located along a line extending from 8 miles northwest of oak trail shores to near granbury to near glen rose, moving east at 35 mph (radar indicated). Hazards include 60 mph wind gusts and quarter size hail. Hail damage to vehicles is expected. expect wind damage to roofs, siding, and trees. Locations impacted include, granbury, pecan plantation, glen rose, lipan, dinosaur valley state park, oak trail shores and tolar. 3/13/2019 4:27 AM CDT At 427 am cdt, severe thunderstorms were located along a line extending from krum to cleburne, moving east at 45 mph (radar indicated). Hazards include 70 mph wind gusts. Expect considerable tree damage. damage is likely to mobile homes, roofs, and outbuildings. 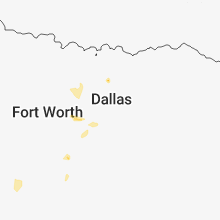 Locations impacted include, fort worth, arlington, plano, grand prairie, carrollton, frisco, denton, lewisville, flower mound, mansfield, euless, bedford, grapevine, haltom city, keller, coppell, hurst, burleson, the colony and cleburne. 3/9/2019 5:11 AM CST The severe thunderstorm warning for northeastern erath and hood counties will expire at 515 am cst, the storm which prompted the warning has weakened below severe limits. therefore the warning will be allowed to expire. however, dime-sized hail is still possible with this thunderstorm. 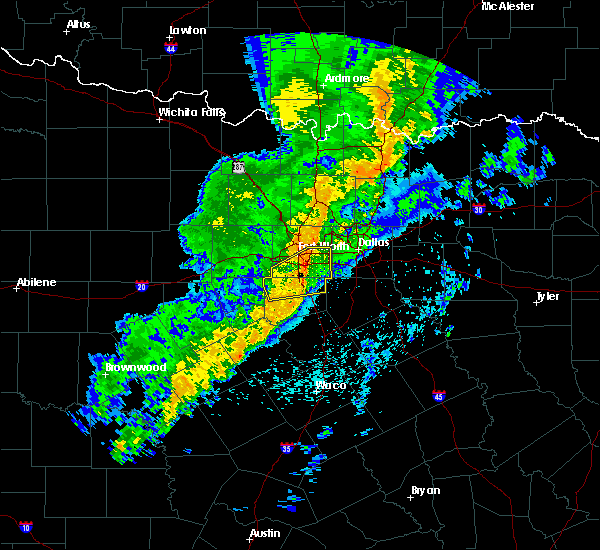 a severe thunderstorm watch remains in effect until 1100 am cst for north central texas. 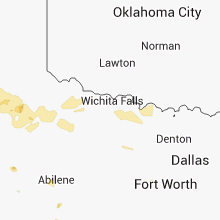 3/9/2019 4:23 AM CST At 421 am cst, a severe thunderstorm was located 9 miles southwest of weatherford, moving northeast at 55 mph (radar indicated). Hazards include golf ball size hail. People and animals outdoors will be injured. expect damage to roofs, siding, windows, and vehicles. Locations impacted include, aledo, annetta, annetta south and annetta north. 3/9/2019 4:05 AM CST At 405 am cst, a severe thunderstorm was located over lipan, or 16 miles northwest of granbury, moving east at 65 mph (radar indicated). Hazards include golf ball size hail. People and animals outdoors will be injured. expect damage to roofs, siding, windows, and vehicles. Locations impacted include, granbury, aledo, annetta, lipan, oak trail shores, annetta south and annetta north. 8/9/2018 5:53 PM CDT The severe thunderstorm warning for northwestern johnson, southeastern parker and southwestern tarrant counties will expire at 600 pm cdt, the storms which prompted the warning have weakened below severe limits. therefore the warning will be allowed to expire. however gusty winds 40 to 50 mph and heavy rain are still possible with this thunderstorm. minor flooding of drainage ditches and low lying areas, as well as street flooding will be likely. turn around, don`t drown! to report severe weather, contact your nearest law enforcement agency. 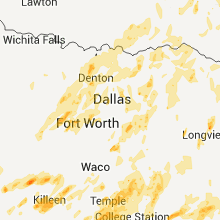 they will relay your report to the national weather service fort worth. 6/24/2018 2:09 AM CDT The severe thunderstorm warning for somervell, western johnson, north central bosque and east central hood counties will expire at 215 am cdt, the storms which prompted the warning have weakened below severe limits. therefore the warning will be allowed to expire. 6/24/2018 1:23 AM CDT At 122 am cdt, severe thunderstorms were located along a line extending from near godley to near glen rose, moving east at 20 mph (radar indicated). Hazards include 60 mph wind gusts and half dollar size hail. Hail damage to vehicles is expected. Expect wind damage to roofs, siding, and trees. 6/24/2018 1:09 AM CDT The severe thunderstorm warning for south central parker and northeastern hood counties will expire at 115 am cdt, the storm which prompted the warning has moved out of the area. therefore the warning will be allowed to expire. remember, a severe thunderstorm warning still remains in effect for southern hood county and also southeastern parker county. 6/24/2018 12:53 AM CDT At 1252 am cdt, a severe thunderstorm was located near aledo, or 10 miles southwest of benbrook, moving northeast at 15 mph (radar indicated). Hazards include 60 mph wind gusts and half dollar size hail. Hail damage to vehicles is expected. Expect wind damage to roofs, siding, and trees. 6/24/2018 12:35 AM CDT At 1234 am cdt, a severe thunderstorm was located near oak trail shores, or near granbury, moving northeast at 15 mph (radar indicated). Hazards include 60 mph wind gusts and half dollar size hail. Hail damage to vehicles is expected. Expect wind damage to roofs, siding, and trees. 5/3/2018 10:29 AM CDT At 1028 am cdt, a severe thunderstorm was located near forest hill and rendon, moving northeast at 60 mph (radar indicated). Hazards include 70 mph wind gusts. Expect considerable tree damage. damage is likely to mobile homes, roofs, and outbuildings. Locations impacted include, fort worth, arlington, grand prairie, mansfield, haltom city, hurst, burleson, cleburne, benbrook, crowley, forest hill, richland hills, kennedale, everman, keene, joshua, alvarado, rendon, venus and edgecliff village. 5/3/2018 10:09 AM CDT At 1009 am cdt, a severe thunderstorm was located near godley, or near joshua, moving northeast at 60 mph (radar indicated). Hazards include 70 mph wind gusts. Expect considerable tree damage. Damage is likely to mobile homes, roofs, and outbuildings. 4/21/2018 5:54 PM CDT The severe thunderstorm warning for southeastern parker and northwestern tarrant counties will expire at 600 pm cdt, the storm which prompted the warning has weakened below severe limits. therefore the warning will be allowed to expire. however small hail and gusty winds are still possible with this thunderstorm. 4/21/2018 5:35 PM CDT At 534 pm cdt, a severe thunderstorm was located 7 miles southwest of annetta, or 9 miles south of weatherford, moving east at 35 mph (trained weather spotters). Hazards include golf ball size hail and 60 mph wind gusts. People and animals outdoors will be injured. expect hail damage to roofs, siding, windows, and vehicles. expect wind damage to roofs, siding, and trees. Locations impacted include, fort worth, bedford, haltom city, keller, hurst, weatherford, watauga, colleyville, benbrook, saginaw, white settlement, crowley, forest hill, azle, richland hills, river oaks, sansom park, lake worth, eagle mountain and north richland hills. 4/21/2018 5:23 PM CDT At 522 pm cdt, two severe thunderstorms were located from near lakeside to 8 miles southwest of weatherford, moving east at 25 mph (radar indicated). Hazards include 60 mph wind gusts and quarter size hail. Hail damage to vehicles is expected. expect wind damage to roofs, siding, and trees. Locations impacted include, fort worth, bedford, haltom city, keller, hurst, weatherford, watauga, colleyville, benbrook, saginaw, white settlement, crowley, forest hill, azle, richland hills, river oaks, sansom park, lake worth, eagle mountain and north richland hills. 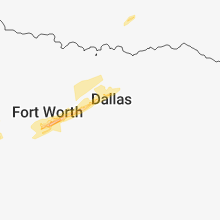 4/21/2018 5:05 PM CDT The national weather service in fort worth has issued a * severe thunderstorm warning for. parker county in north central texas. northwestern tarrant county in north central texas. until 600 pm cdt. At 503 pm cdt, two severe thunderstorms located near willow park. 1/21/2018 3:34 PM CST At 333 pm cst, a severe thunderstorm was located over godley, or 11 miles west of joshua, moving northeast at 40 mph (radar indicated). Hazards include 60 mph wind gusts and quarter size hail. Hail damage to vehicles is expected. Expect wind damage to roofs, siding, and trees. 8/6/2017 7:53 PM CDT At 753 pm cdt, a severe thunderstorm was located near granbury, moving south at 15 mph (radar indicated). Hazards include 60 mph wind gusts. Expect damage to roofs, siding, and trees. Locations impacted include, fort worth, arlington, mansfield, burleson, cleburne, benbrook, white settlement, crowley, forest hill, granbury, river oaks, kennedale, everman, keene, joshua, sansom park, lake worth, alvarado, rendon and eagle mountain. 8/6/2017 7:06 PM CDT At 705 pm cdt, a severe thunderstorm was located over annetta, or 7 miles southeast of weatherford, moving south at 15 mph. 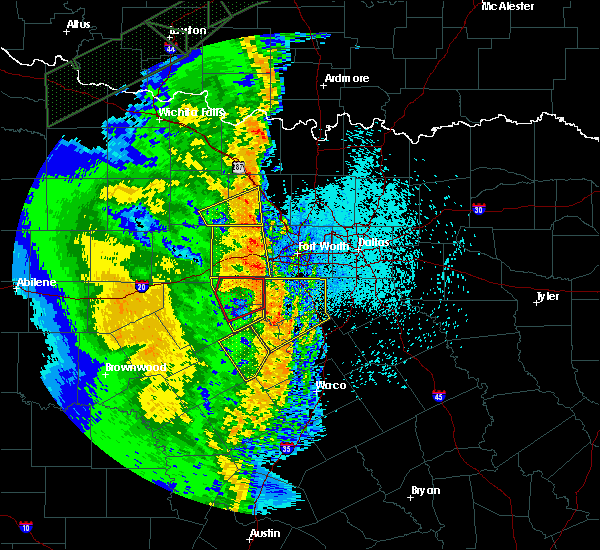 this storm has a history of producing wind damage just north of aledo (radar indicated). Hazards include 65 mph wind gusts and quarter size hail. Hail damage to vehicles is expected. expect wind damage to roofs, siding, and trees. Locations impacted include, weatherford, azle, willow park, reno, aledo, hudson oaks, annetta, annetta south, annetta north and sanctuary. 8/6/2017 6:38 PM CDT At 637 pm cdt, a severe thunderstorm was located over willow park, or near weatherford, moving south at 15 mph. this storm has a history of producing wind damage in springtown (radar indicated). Hazards include 65 mph wind gusts and quarter size hail. Hail damage to vehicles is expected. Expect wind damage to roofs, siding, and trees. 7/9/2017 5:52 PM CDT At 551 pm cdt, a severe thunderstorm was located 4 miles north of godley, or 9 miles northwest of joshua, moving east at 10 mph (radar indicated). Hazards include 60 mph wind gusts. Expect damage to roofs, siding, and trees. Locations impacted include, godley. 7/9/2017 5:36 PM CDT At 536 pm cdt, a severe thunderstorm was located near godley, or 12 miles west of joshua, moving east at 10 mph (radar indicated). Hazards include 60 mph wind gusts and quarter size hail. Hail damage to vehicles is expected. Expect wind damage to roofs, siding, and trees. 5/19/2017 11:54 PM CDT The severe thunderstorm warning for southeastern parker and northeastern hood counties will expire at midnight cdt, the storm which prompted the warning has moved out of the area. therefore the warning will be allowed to expire. 5/19/2017 11:13 PM CDT At 1111 pm cdt, a severe thunderstorm was located near oak trail shores, or near granbury, moving east at 60 mph (radar indicated and a weather station measured a 60 mph gust north of granbury ). Hazards include 70 mph wind gusts and penny size hail. Expect considerable tree damage. damage is likely to mobile homes, roofs, and outbuildings. Locations impacted include, granbury, pecan plantation, willow park, aledo, annetta, oak trail shores, annetta south and annetta north. 4/21/2017 8:45 PM CDT At 844 pm cdt, a severe thunderstorm was located over weatherford, moving east at 35 mph (radar indicated). Hazards include 60 mph wind gusts and quarter size hail. Hail damage to vehicles is expected. expect wind damage to roofs, siding, and trees. locations impacted include, weatherford, willow park, aledo, hudson oaks, annetta, annetta south and annetta north. A tornado watch remains in effect until 100 am cdt for north central texas. 4/21/2017 8:21 PM CDT At 820 pm cdt, a severe thunderstorm was located over cool, or near mineral wells, moving southeast at 30 mph (radar indicated). Hazards include 60 mph wind gusts and quarter size hail. Hail damage to vehicles is expected. Expect wind damage to roofs, siding, and trees. 4/11/2017 2:18 AM CDT At 218 am cdt, a severe thunderstorm was located near godley, or 9 miles east of granbury, moving east at 15 mph (radar indicated). Hazards include quarter size hail. Damage to vehicles is possible. Locations impacted include, granbury and godley. 3/29/2017 2:05 AM CDT At 204 am cdt, a severe thunderstorm was located over alvarado, moving northeast at 60 mph (radar indicated). Hazards include 70 mph wind gusts. Expect considerable tree damage. damage is likely to mobile homes, roofs, and outbuildings. Locations impacted include, mansfield, burleson, cleburne, keene, joshua, alvarado, venus, itasca, grandview, godley, blum, covington, cross timber, cleburne state park, rio vista and briaroaks. 3/29/2017 1:56 AM CDT At 156 am cdt, severe thunderstorms were located along a line extending from near decatur to near aledo, moving east at 25 mph (radar indicated). Hazards include 60 mph wind gusts and penny size hail. Expect damage to roofs, siding, and trees. these severe storms will be near, decatur around 210 am cdt. 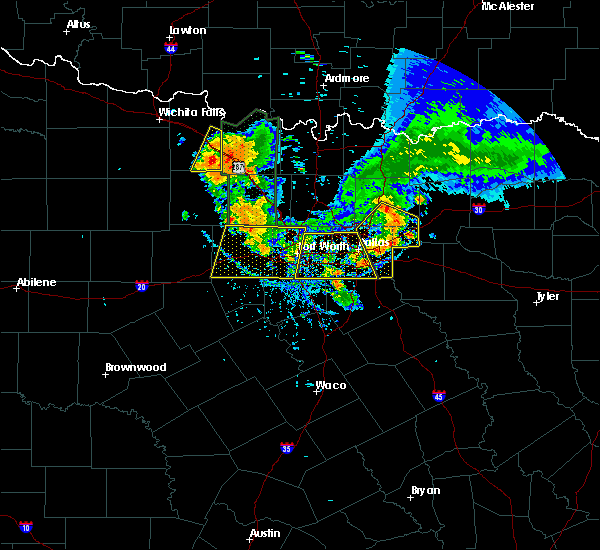 benbrook and white settlement around 220 am cdt. westworth village and westworth around 225 am cdt. crowley, forest hill, river oaks, everman, sansom park, edgecliff village, new fairview and edgecliff around 230 am cdt. Other locations impacted by these severe thunderstorms include westlake, ponder, rhome, westover hills, newark, sanctuary and marshall creek. 3/29/2017 1:53 AM CDT The tornado warning for northern somervell and hood counties will expire at 200 am cdt, the storm which prompted the warning has moved out of the area. therefore the warning will be allowed to expire. however, gusty winds are still possible with this thunderstorm. a severe thunderstorm watch remains in effect until 400 am cdt for north texas. 3/29/2017 1:49 AM CDT At 149 am cdt, severe thunderstorms were located along a line extending from near paradise to near annetta, moving east at 25 mph (radar indicated). Hazards include 60 mph wind gusts and penny size hail. Expect damage to roofs, siding, and trees. severe thunderstorms will be near, decatur around 205 am cdt. 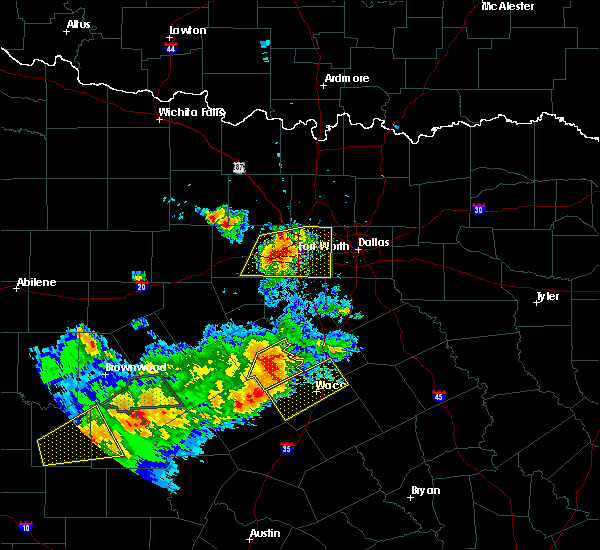 benbrook and white settlement around 220 am cdt. 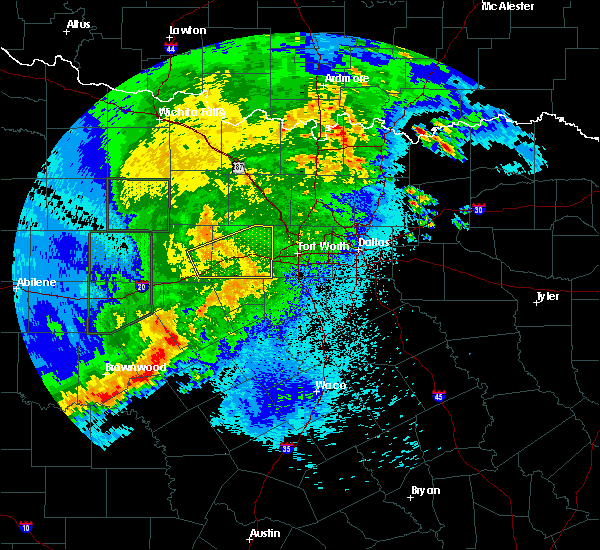 river oaks, sansom park, westworth village, new fairview and westworth around 225 am cdt. crowley, forest hill, kennedale, everman, edgecliff village and edgecliff around 230 am cdt. other locations impacted by these severe thunderstorms include westlake, ponder, rhome, westover hills, newark, sanctuary and marshall creek. this includes the following interstates, interstate 35w between mile markers 38 and 81. interstate 20 between mile markers 419 and 453. Interstate 30 between mile markers 1 and 31. 3/29/2017 1:47 AM CDT At 147 am cdt, a severe thunderstorm was located near godley, moving northeast at 60 mph (radar indicated). Hazards include 70 mph wind gusts. Expect considerable tree damage. damage is likely to mobile homes, roofs, and outbuildings. Locations impacted include, mansfield, burleson, cleburne, keene, joshua, alvarado, venus, itasca, grandview, godley, blum, covington, cross timber, cleburne state park, rio vista, briaroaks and morgan. 3/29/2017 1:41 AM CDT At 141 am cdt, a severe thunderstorm was located near pecan plantation, or near granbury, moving northeast at 45 mph (radar indicated). Hazards include 70 mph wind gusts. Expect considerable tree damage. damage is likely to mobile homes, roofs, and outbuildings. Locations impacted include, granbury, pecan plantation, glen rose, lipan, dinosaur valley state park, oak trail shores and tolar. 3/29/2017 1:40 AM CDT At 139 am cdt, a severe thunderstorm was located 7 miles south of cleburne state park, or 15 miles southwest of cleburne, moving northeast at 60 mph (radar indicated). Hazards include 65 mph wind gusts. Expect damage to roofs, siding, and trees. 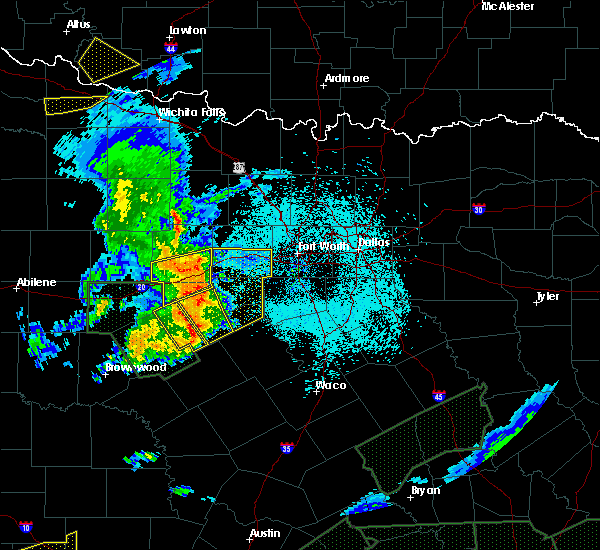 this severe thunderstorm will be near, blum around 145 am cdt. keene and grandview around 200 am cdt. 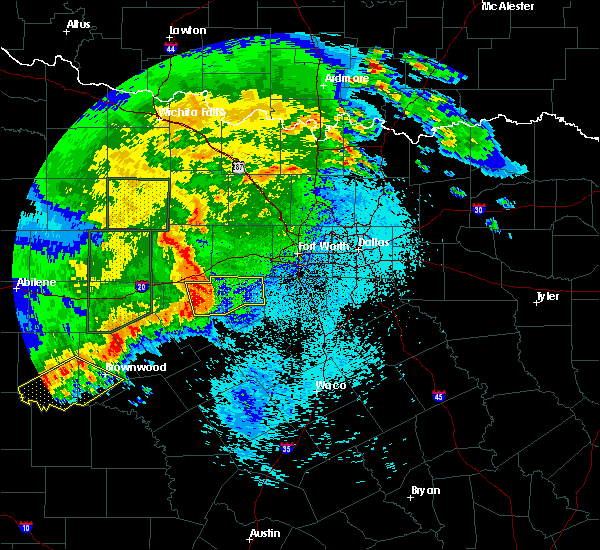 alvarado around 205 am cdt. venus around 210 am cdt. 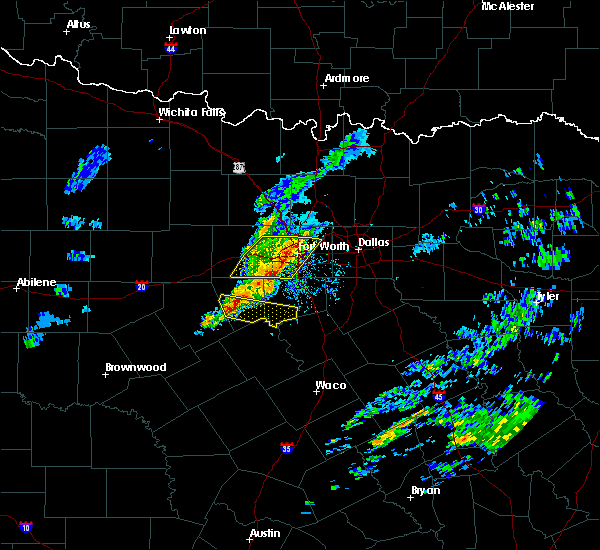 other locations impacted by this severe thunderstorm include briaroaks, morgan and rio vista. This includes interstate 35w between mile markers 9 and 37. 3/29/2017 1:31 AM CDT At 130 am cdt, a severe squall line capable of producing both tornadoes and extensive straight line wind damage was located over granbury, moving northeast at 45 mph (radar indicated rotation). Hazards include tornado. Flying debris will be dangerous to those caught without shelter. mobile homes will be damaged or destroyed. damage to roofs, windows, and vehicles will occur. tree damage is likely. Locations impacted include, granbury, pecan plantation, glen rose, dinosaur valley state park, oak trail shores and tolar. 3/29/2017 1:25 AM CDT At 125 am cdt, severe thunderstorms capable of producing both tornadoes and extensive straight line wind damage were located 7 miles northwest of dinosaur valley state park, or 12 miles southwest of granbury, moving northeast at 35 mph (radar indicated rotation). Hazards include tornado. Flying debris will be dangerous to those caught without shelter. mobile homes will be damaged or destroyed. damage to roofs, windows, and vehicles will occur. Tree damage is likely. 3/29/2017 1:24 AM CDT At 124 am cdt, a severe thunderstorm was located 7 miles east of cool, or 7 miles northwest of weatherford, moving northeast at 45 mph (radar indicated). Hazards include 60 mph wind gusts and nickel size hail. Expect damage to roofs, siding, and trees. this severe thunderstorm will be near, weatherford and hudson oaks around 135 am cdt. willow park around 140 am cdt. 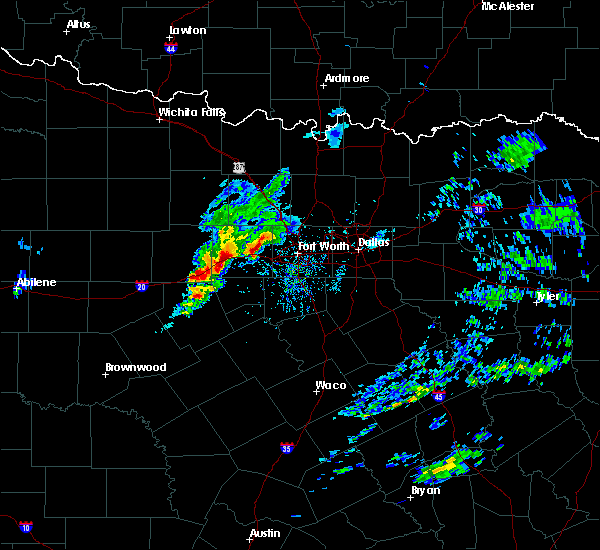 springtown around 145 am cdt. other locations impacted by this severe thunderstorm include annetta south, annetta north and millsap. This includes interstate 20 between mile markers 390 and 419. 7/27/2016 5:07 PM CDT The severe thunderstorm warning for southeastern parker county will expire at 515 pm cdt, the storm which prompted the warning has weakened below severe limits. therefore the warning will be allowed to expire. however gusty winds are still possible with this thunderstorm along with lingering heavy rainfall. to report severe weather, contact your nearest law enforcement agency. 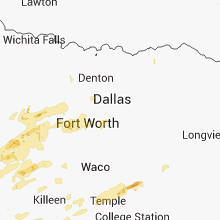 they will relay your report to the national weather service fort worth. 7/27/2016 4:29 PM CDT At 428 pm cdt, a severe thunderstorm was located over hudson oaks, or near weatherford, moving south at 10 mph (radar indicated). Hazards include 60 mph wind gusts. Expect damage to roofs. siding. and trees. 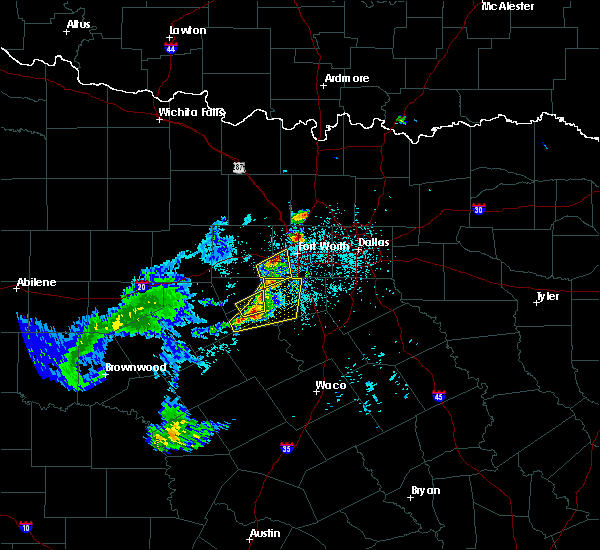 this severe thunderstorm will be near, weatherford around 435 pm cdt. aledo around 440 pm cdt. annetta around 445 pm cdt. other locations impacted by this severe thunderstorm include annetta north and annetta south. this includes the following interstates, interstate 20 between mile markers 404 and 422. Interstate 30 near mile marker 1. 7/9/2016 5:07 PM CDT The severe thunderstorm warning for parker and western tarrant counties will expire at 515 pm cdt, the storm which prompted the warning has weakened below severe limits. therefore the warning will be allowed to expire. however gusty winds of 40 to 50 mph are still possible with this thunderstorm. 7/9/2016 4:35 PM CDT At 434 pm cdt, a severe thunderstorm was located over eagle mountain, moving southwest at 20 mph (radar indicated). Hazards include 60 mph wind gusts. Expect damage to roofs. siding. and trees. this severe thunderstorm will be near, haltom city, saginaw, eagle mountain, blue mound and pelican bay around 440 pm cdt. lake worth around 455 pm cdt. river oaks, sansom park and lakeside around 500 pm cdt. white settlement and westworth village around 505 pm cdt. benbrook and aledo around 515 pm cdt. other locations impacted by this severe thunderstorm include annetta north, millsap, sanctuary, westover hills, annetta south and newark. 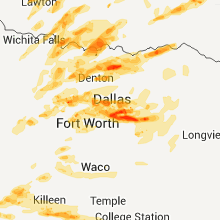 this includes the following interstates, interstate 35w between mile markers 45 and 67. interstate 20 between mile markers 392 and 436. interstate 30 between mile markers 1 and 16. Interstate 820 between mile markers 1 and 18. 7/5/2016 12:12 AM CDT At 1211 am cdt, a severe thunderstorm was located near godley, or near joshua, moving southeast at 35 mph (radar indicated). Hazards include 60 mph wind gusts. Expect damage to roofs. siding. and trees. 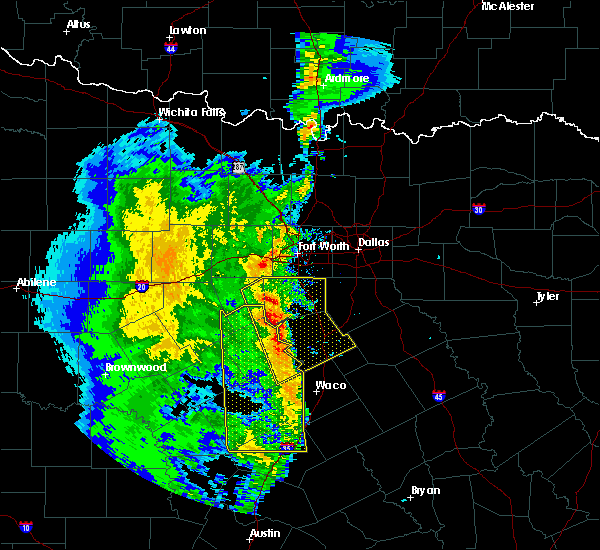 this severe thunderstorm will be near, burleson and joshua around 1220 am cdt. 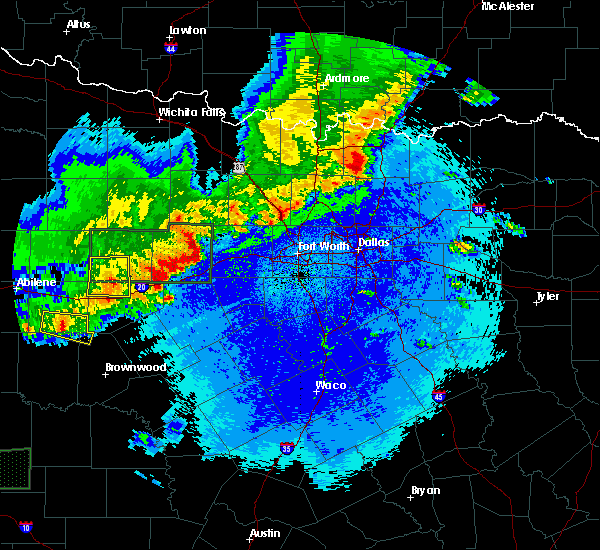 cleburne and cross timber around 1225 am cdt. keene around 1230 am cdt. 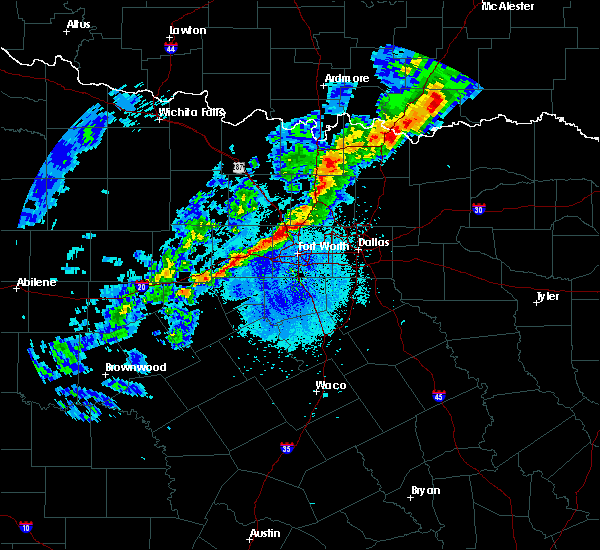 alvarado around 1240 am cdt. venus around 1250 am cdt. other locations impacted by this severe thunderstorm include briaroaks. This includes interstate 35w between mile markers 15 and 43. 7/4/2016 11:37 PM CDT At 1136 pm cdt, a severe thunderstorm was located near annetta, or 7 miles southeast of weatherford, moving east at 40 mph (radar indicated). Hazards include 60 mph wind gusts. Expect damage to roofs. siding. and trees. this severe thunderstorm will be near, annetta around 1140 pm cdt. 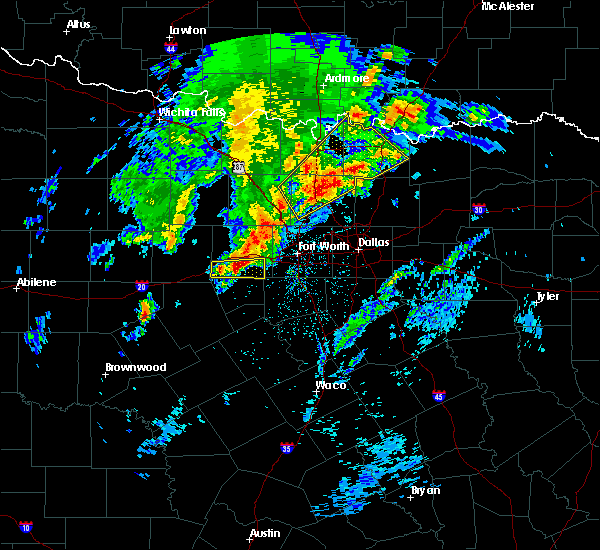 aledo around 1145 pm cdt. crowley, joshua, edgecliff village and edgecliff around 1210 am cdt. burleson, everman, rendon and cross timber around 1215 am cdt. other locations impacted by this severe thunderstorm include annetta north, briaroaks and annetta south. this includes the following interstates, interstate 35w between mile markers 25 and 46. interstate 20 between mile markers 415 and 441. interstate 30 between mile markers 1 and 6. Interstate 820 between mile markers 1 and 4. 5/31/2016 2:42 PM CDT At 242 pm cdt, severe thunderstorms were located along a line extending from near granbury to near glen rose, moving east at 5 mph (radar indicated. granbury weather station also reported a wind gust to 60 mph). Hazards include 60 mph wind gusts. Expect damage to roofs. siding. and trees. 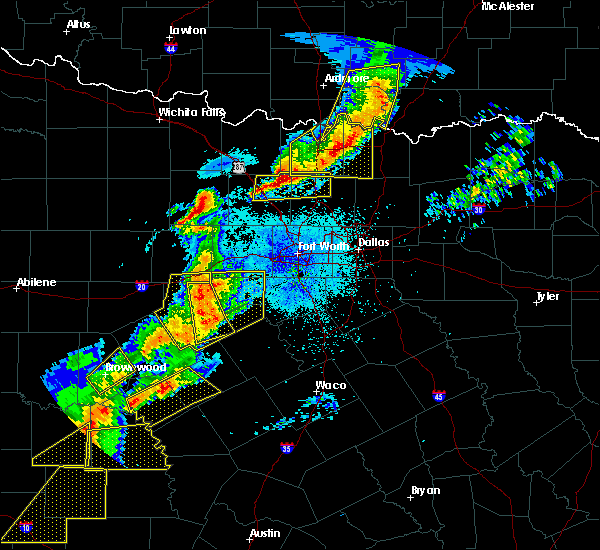 severe thunderstorms will be near, granbury, pecan plantation and glen rose around 315 pm cdt. 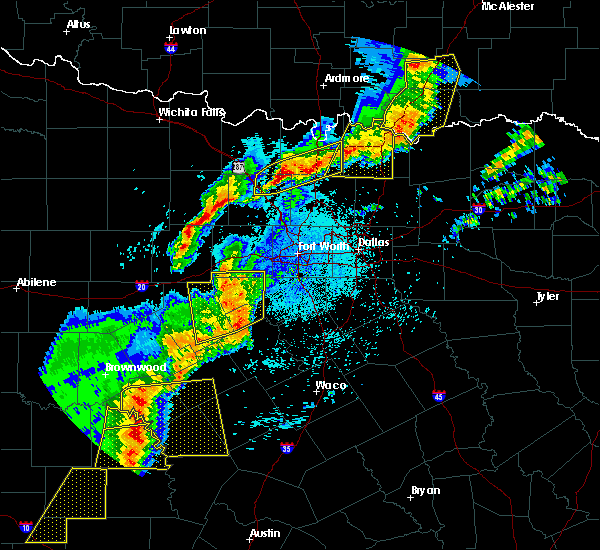 Other locations impacted by these severe thunderstorms include tolar. 5/30/2016 2:07 AM CDT The severe thunderstorm warning for parker and southeastern palo pinto counties will expire at 215 am cdt, the storm which prompted the warning has weakened below severe limits. therefore the warning will be allowed to expire. however heavy rain is still possible with this thunderstorm. 5/30/2016 1:29 AM CDT At 128 am cdt, a severe thunderstorm was located 8 miles south of mineral wells, moving east at 55 mph (radar indicated). Hazards include 60 mph wind gusts. Expect damage to roofs. siding. and trees. 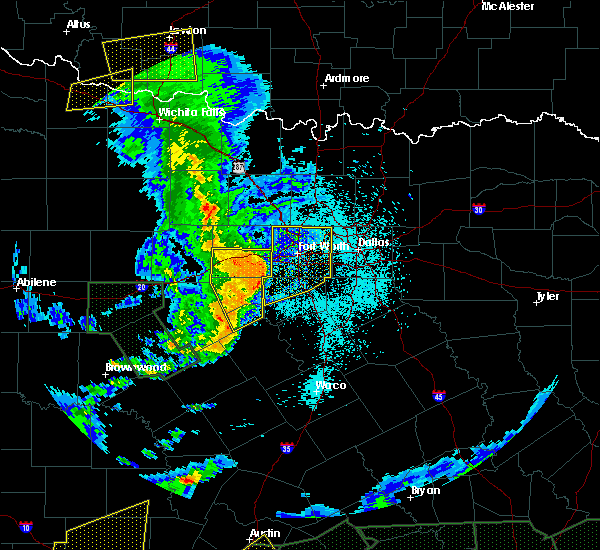 this severe thunderstorm will be near, cool around 135 am cdt. mineral wells state park around 140 am cdt. 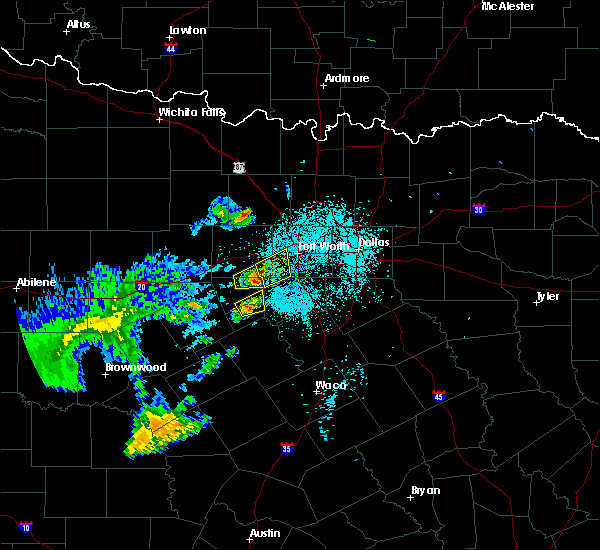 weatherford and hudson oaks around 155 am cdt. willow park around 200 am cdt. 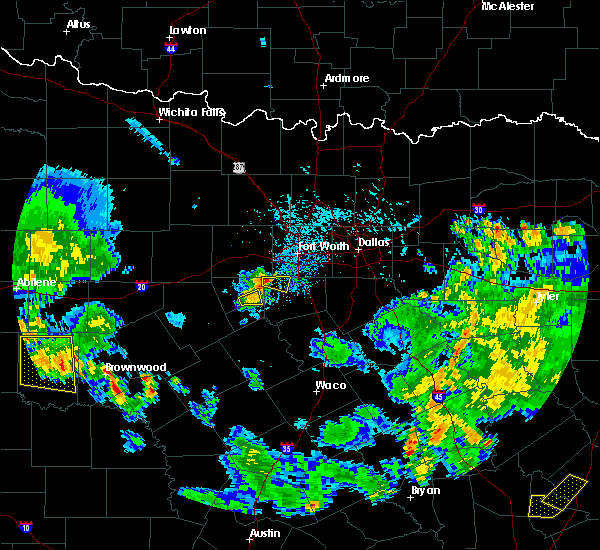 azle and briar around 210 am cdt. other locations impacted by this severe thunderstorm include annetta north, millsap, sanctuary and annetta south. this includes the following interstates, interstate 20 between mile markers 382 and 422. Interstate 30 near mile marker 1. 5/27/2016 4:39 AM CDT At 439 am cdt, severe thunderstorms were located along a line extending from near burleson to near covington, moving east at 45 mph (radar indicated). Hazards include 60 mph wind gusts and penny size hail. Expect damage to roofs. siding. and trees. these severe storms will be near, itasca and grandview around 445 am cdt. 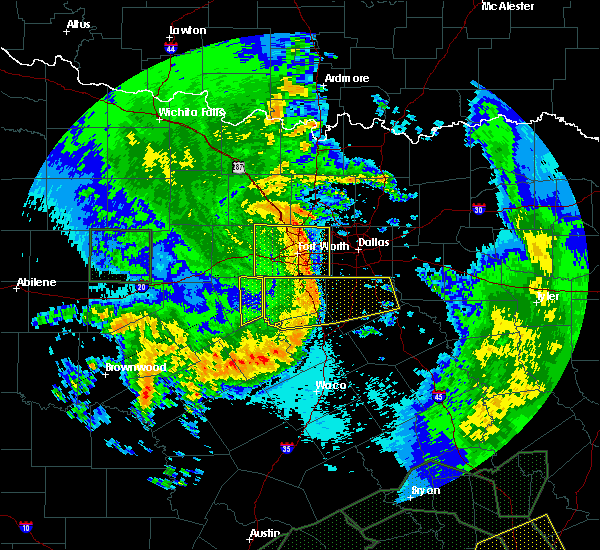 mansfield around 455 am cdt. 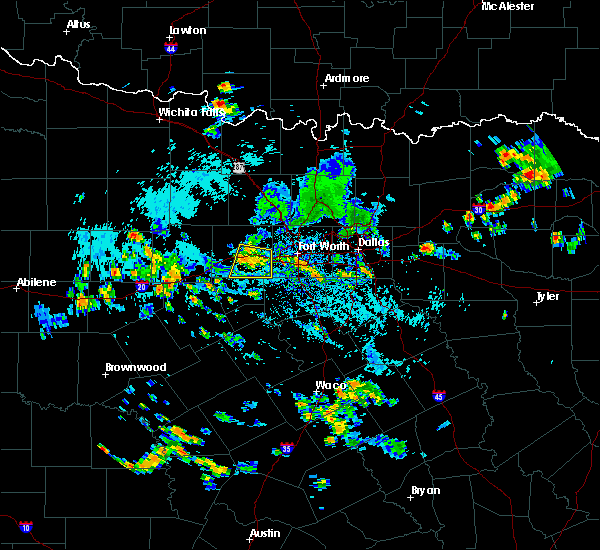 maypearl around 500 am cdt. 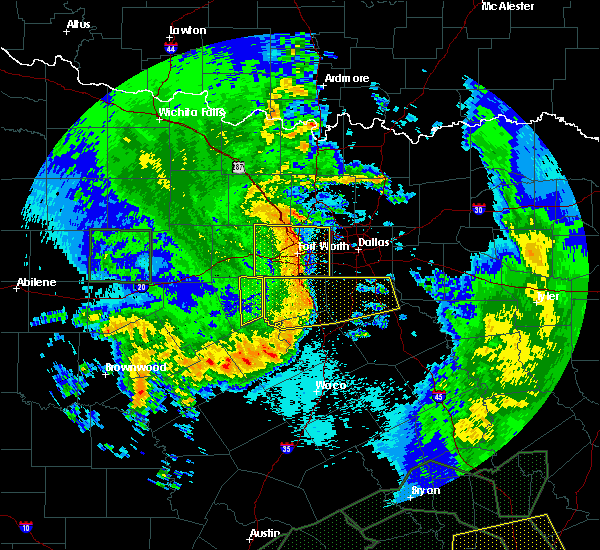 cedar hill and italy around 505 am cdt. midlothian and ovilla around 510 am cdt. 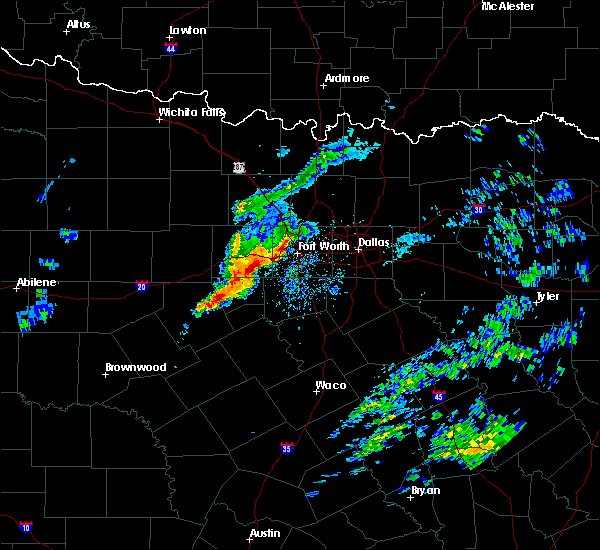 lancaster, glenn heights, red oak, oak leaf and bardwell around 515 am cdt. Other locations impacted by these severe thunderstorms include rio vista, briaroaks, pecan hill and garrett. 5/27/2016 4:36 AM CDT The severe thunderstorm warning for eastern hood and eastern somervell counties will expire at 445 am cdt, the storms which prompted the warning have moved out of the area. therefore the warning will be allowed to expire. 5/27/2016 4:20 AM CDT At 419 am cdt, severe thunderstorms were located along a line extending from 6 miles northwest of godley to near cleburne state park, moving east at 50 mph (radar indicated). Hazards include 60 mph wind gusts. Expect damage to roofs. siding. and trees. 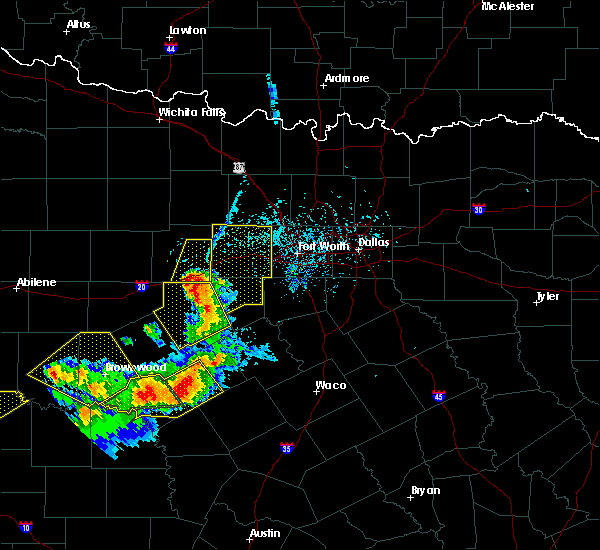 These severe thunderstorms will remain over mainly rural areas of eastern hood and northeastern somervell counties. 5/27/2016 4:13 AM CDT At 413 am cdt, severe thunderstorms were located along a line extending from 8 miles northwest of godley to near cleburne state park, moving east at 55 mph (radar indicated). Hazards include 65 mph wind gusts and penny size hail. Expect damage to roofs. siding. and trees. 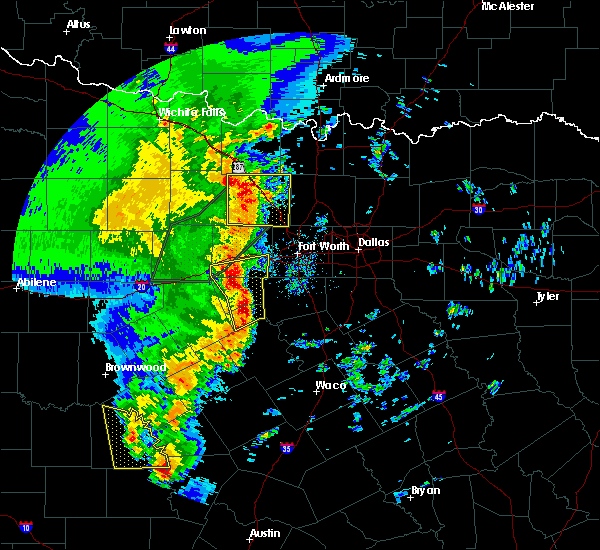 severe thunderstorms will be near, blum around 425 am cdt. burleson, joshua and cross timber around 430 am cdt. covington around 435 am cdt. grandview around 440 am cdt. mansfield and itasca around 445 am cdt. cedar hill, midlothian and maypearl around 455 am cdt. glenn heights, ovilla and italy around 500 am cdt. 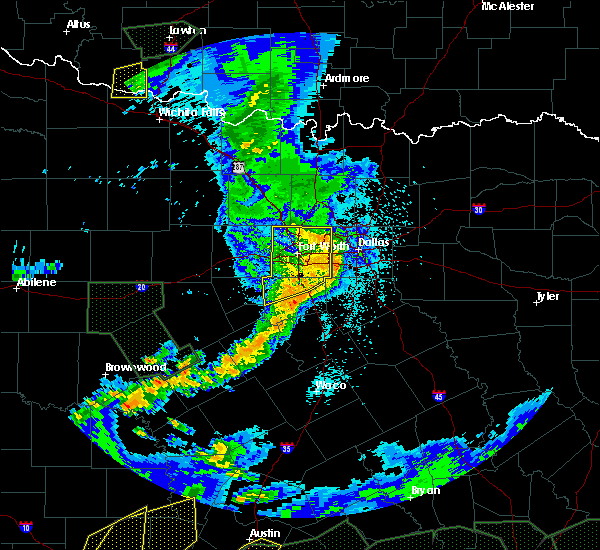 lancaster and red oak around 505 am cdt. other locations impacted by these severe thunderstorms include rio vista, briaroaks, pecan hill and garrett. this includes the following interstates, interstate 35w between mile markers 7 and 37. interstate 35e between mile markers 385 and 411. Interstate 45 between mile markers 245 and 266. 5/27/2016 4:08 AM CDT At 408 am cdt, severe thunderstorms were located along a line extending from near springtown to 9 miles south of annetta, moving northeast at 45 mph (radar indicated). Hazards include 60 mph wind gusts and penny size hail. Expect damage to roofs. siding. and trees. 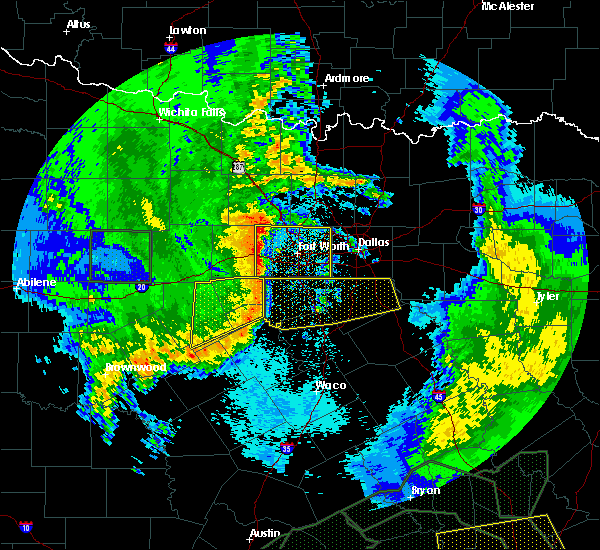 severe thunderstorms will be near, azle, briar, eagle mountain and pelican bay around 415 am cdt. 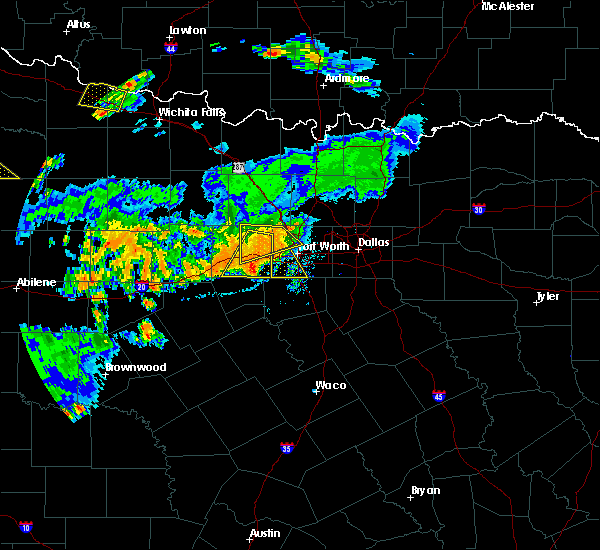 pecan acres and aledo around 420 am cdt. 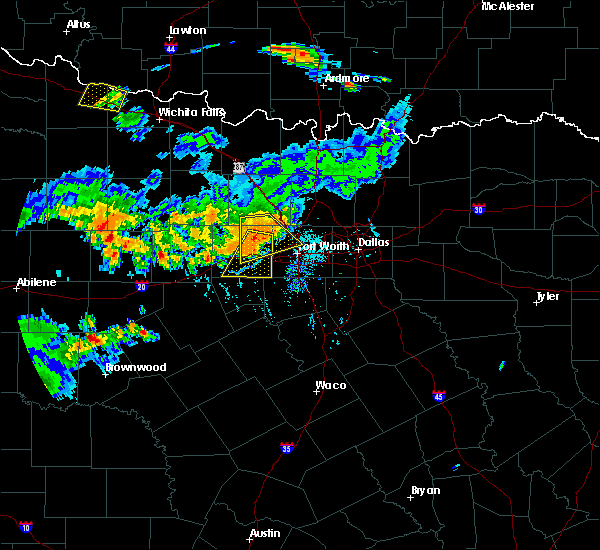 benbrook around 430 am cdt. burleson, crowley, westworth village and edgecliff around 435 am cdt. forest hill, everman and edgecliff village around 440 am cdt. 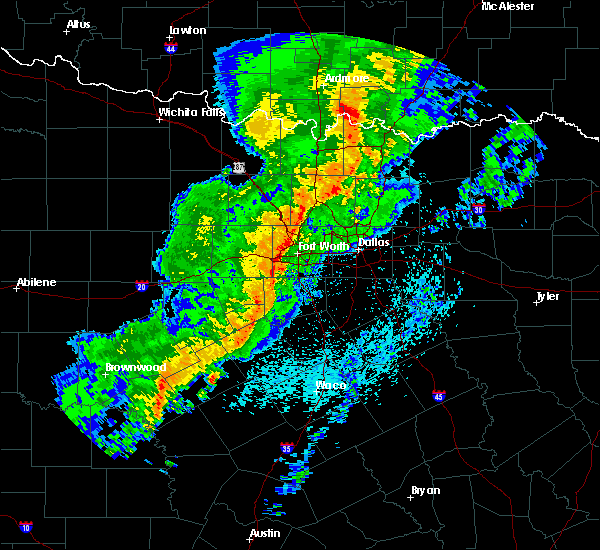 kennedale and rendon around 445 am cdt. 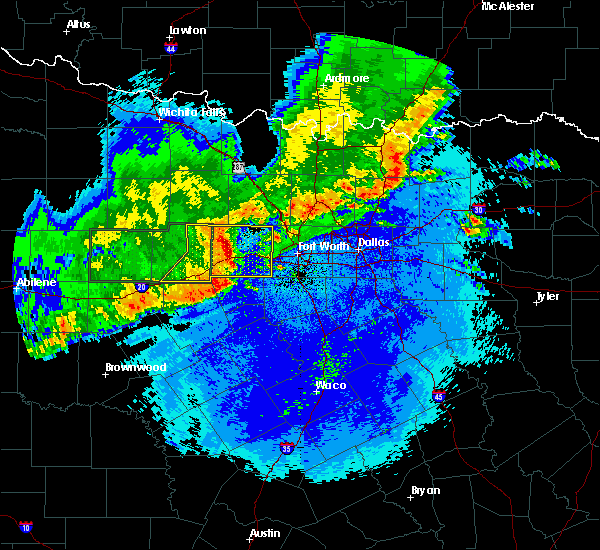 richland hills around 450 am cdt. 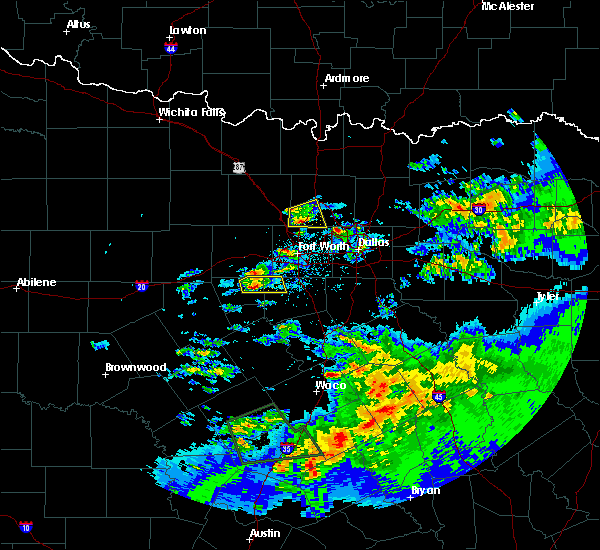 pantego around 455 am cdt. other locations impacted by these severe thunderstorms include annetta north, sanctuary, westover hills, annetta south, westlake and newark. this includes the following interstates, interstate 35w between mile markers 38 and 67. interstate 20 between mile markers 414 and 452. interstate 30 between mile markers 1 and 30. Interstate 820 between mile markers 1 and 35. 5/26/2016 11:07 PM CDT The severe thunderstorm warning for northern johnson and tarrant counties will expire at 1115 pm cdt, the storms which prompted the warning has weakened below severe limits and exited the warned area. therefore the warning will be allowed to expire. however small hail, gusty winds and heavy rain are still possible with these thunderstorms. 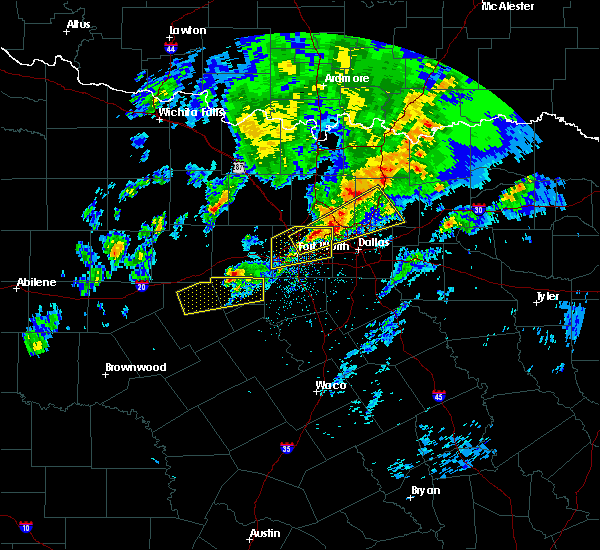 a severe thunderstorm watch remains in effect until 100 am cdt for north central texas. 5/26/2016 10:40 PM CDT At 1039 pm cdt, a severe thunderstorm was located over haltom city, moving northeast at 45 mph (radar indicated). Hazards include 60 mph wind gusts and quarter size hail. Hail damage to vehicles is expected. expect wind damage to roofs, siding, and trees. Locations impacted include, fort worth, arlington, grand prairie, mansfield, euless, bedford, grapevine, haltom city, keller, coppell, hurst, burleson, cleburne, southlake, watauga, colleyville, benbrook, saginaw, white settlement and crowley. 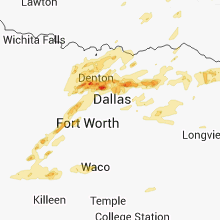 5/26/2016 10:16 PM CDT At 1015 pm cdt, a severe thunderstorm was located near aledo, or near benbrook, moving northeast at 45 mph (radar indicated). Hazards include 70 mph wind gusts and quarter size hail. Hail damage to vehicles is expected. expect considerable tree damage. Wind damage is also likely to mobile homes, roofs, and outbuildings. 5/26/2016 9:39 PM CDT At 939 pm cdt, a severe thunderstorm was located near lipan, or 16 miles west of granbury, moving east at 40 mph (radar indicated). Hazards include 70 mph wind gusts and quarter size hail. Hail damage to vehicles is expected. expect considerable tree damage. wind damage is also likely to mobile homes, roofs, and outbuildings. this severe thunderstorm will be near, oak trail shores around 1000 pm cdt. 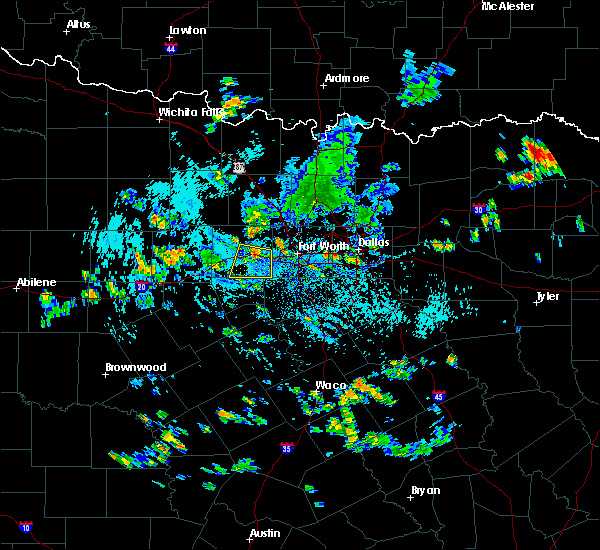 granbury and pecan plantation around 1010 pm cdt. other locations impacted by this severe thunderstorm include annetta north, millsap, annetta south and tolar. this includes the following interstates, interstate 20 between mile markers 390 and 422. Interstate 30 near mile marker 1. 5/11/2016 9:42 PM CDT At 941 pm cdt, a severe thunderstorm was located 7 miles northwest of weatherford, moving east at 35 mph (radar indicated). Hazards include 60 mph wind gusts. Expect damage to roofs. siding. and trees. 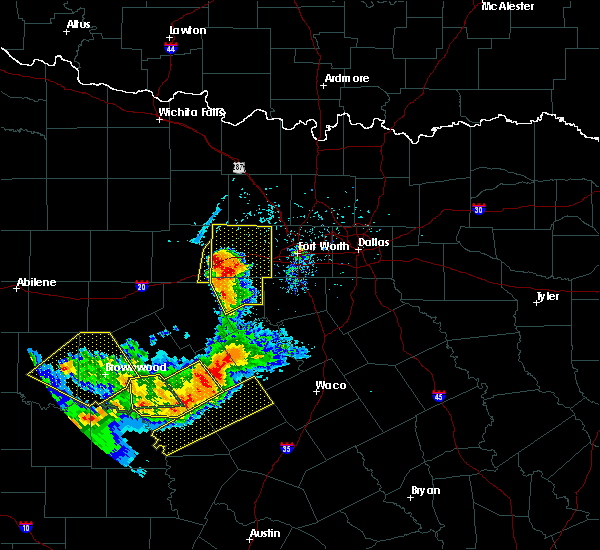 this severe thunderstorm will be near, weatherford and hudson oaks around 955 pm cdt. willow park around 1000 pm cdt. 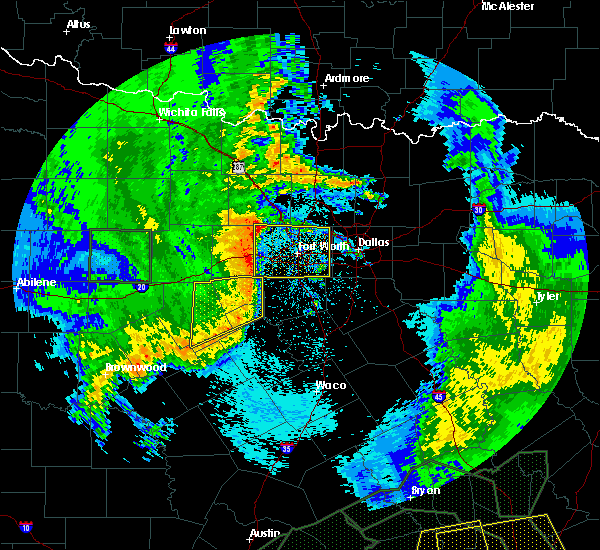 azle and briar around 1010 pm cdt. eagle mountain, pelican bay and lakeside around 1015 pm cdt. 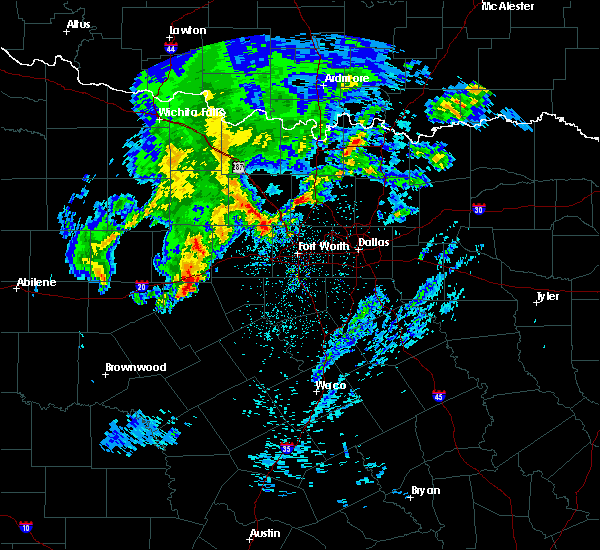 white settlement and lake worth around 1020 pm cdt. saginaw, river oaks, sansom park and westworth village around 1025 pm cdt. blue mound around 1030 pm cdt. 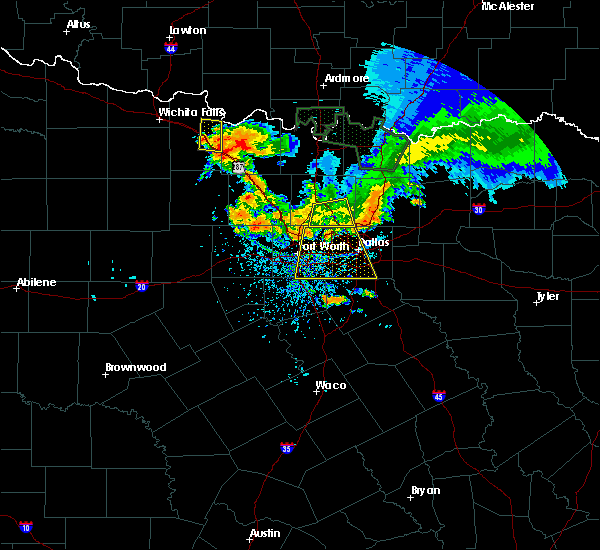 Haltom city and haslet around 1035 pm cdt. 5/10/2016 7:27 PM CDT At 725 pm cdt, severe thunderstorms were located along a line extending from near sansom park to near crowley, moving east at 35 mph (radar indicated. at 720 pm a 70 mph wind gust was reported at jrb navy base in nw fort worth. 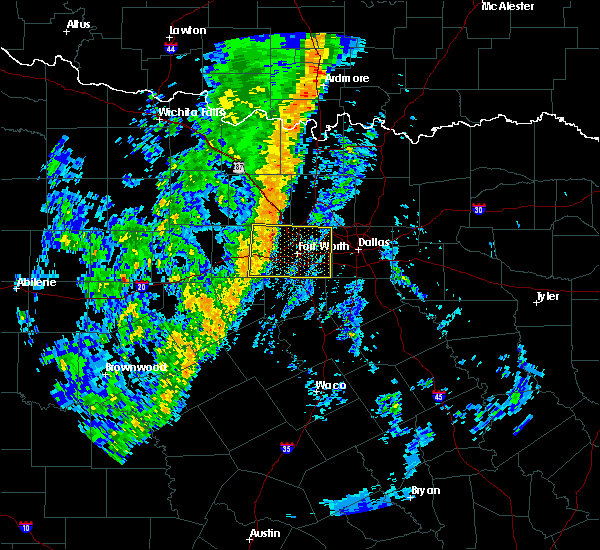 other spotters are reporting 60 to 65 mph winds across western tarrant county). Hazards include 70 mph wind gusts and quarter size hail. Hail damage to vehicles is expected. expect considerable tree damage. wind damage is also likely to mobile homes, roofs, and outbuildings. these severe storms will be near, saginaw and blue mound around 730 pm cdt. 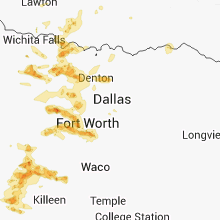 haltom city, burleson, watauga, edgecliff village and edgecliff around 735 pm cdt. forest hill and richland hills around 740 pm cdt. 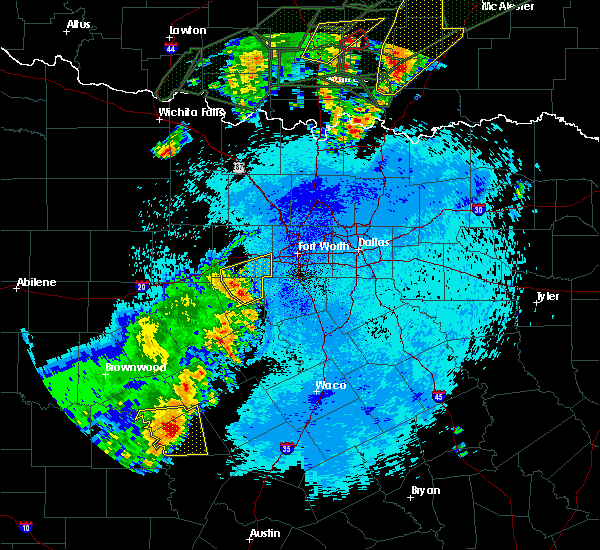 bedford, hurst, kennedale, everman, rendon and north richland hills around 745 pm cdt. colleyville around 750 pm cdt. 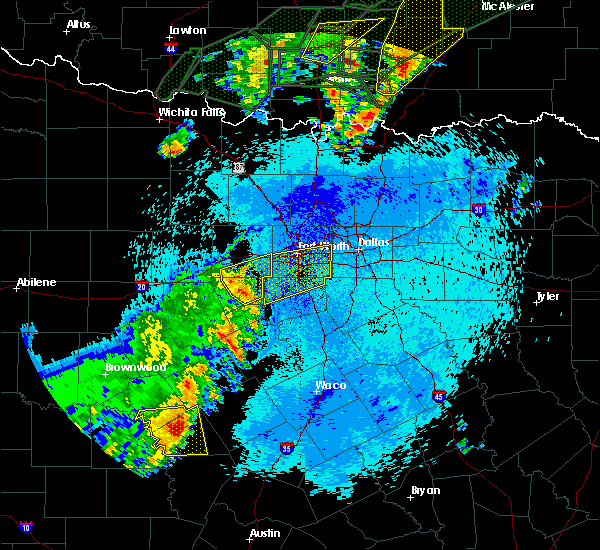 fort worth, arlington, mansfield, euless and pantego around 755 pm cdt. 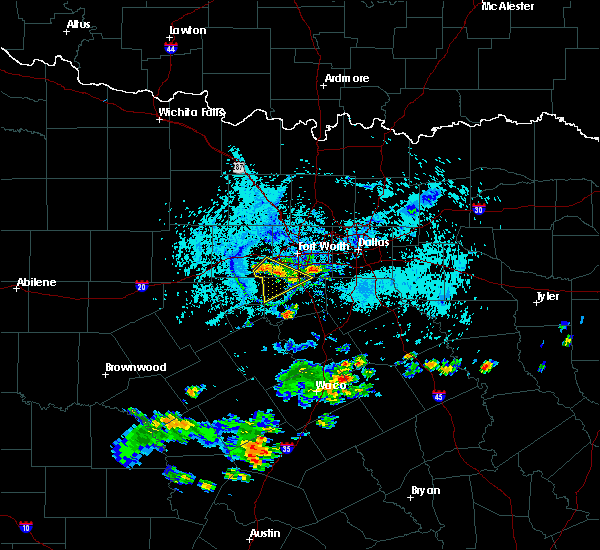 grand prairie around 800 pm cdt. Other locations impacted by these severe thunderstorms include annetta north, sanctuary, westover hills, annetta south and westlake. 5/10/2016 7:11 PM CDT At 709 pm cdt, severe thunderstorms were located along a line extending from near lakeside to 8 miles south of aledo, moving east at 35 mph (radar indicated). Hazards include 65 mph wind gusts and quarter size hail. Hail damage to vehicles is possible. expect wind damage to roofs, siding, and trees. 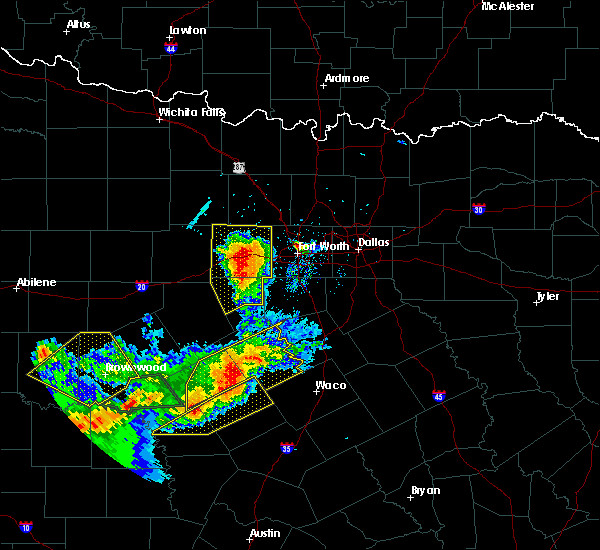 these severe storms will be near, benbrook, white settlement and lakeside around 715 pm cdt. river oaks, sansom park, lake worth and westworth village around 720 pm cdt. 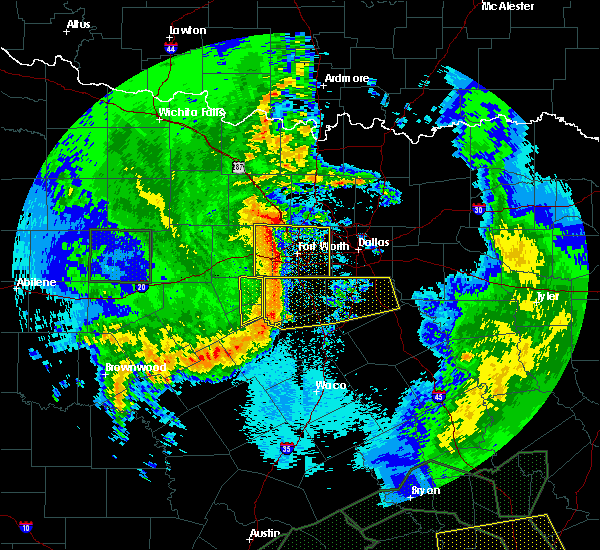 saginaw and fort worth around 725 pm cdt. blue mound around 730 pm cdt. haltom city, burleson, watauga, crowley and edgecliff around 735 pm. forest hill, richland hills and edgecliff village around 740 pm cdt. 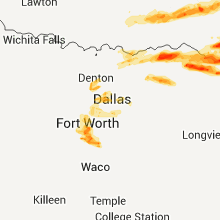 hurst, everman, rendon and north richland hills around 745 pm cdt. 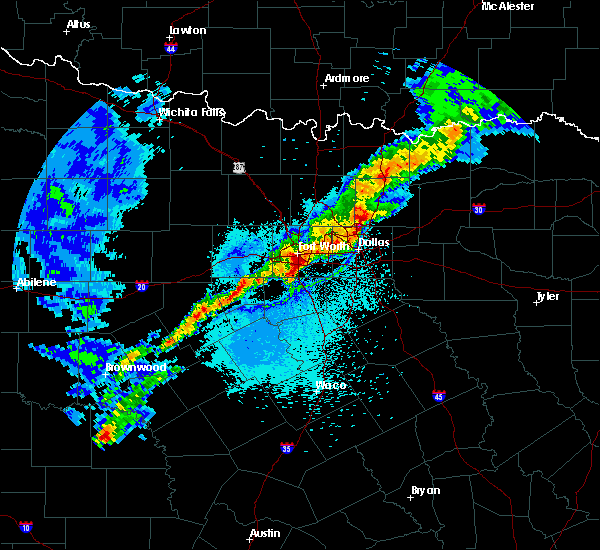 Bedford, colleyville and kennedale around 750 pm cdt. 5/10/2016 6:53 PM CDT At 651 pm cdt, a severe thunderstorm was located over weatherford, moving east at 30 mph (radar indicated). Hazards include ping pong ball size hail and 65 mph wind gusts. People and animals outdoors will be injured. expect hail damage to roofs, siding, windows, and vehicles. expect wind damage to roofs, siding, and trees. this severe thunderstorm will be near, annetta around 655 pm cdt. willow park around 700 pm cdt. aledo around 705 pm cdt. lakeside around 720 pm cdt. 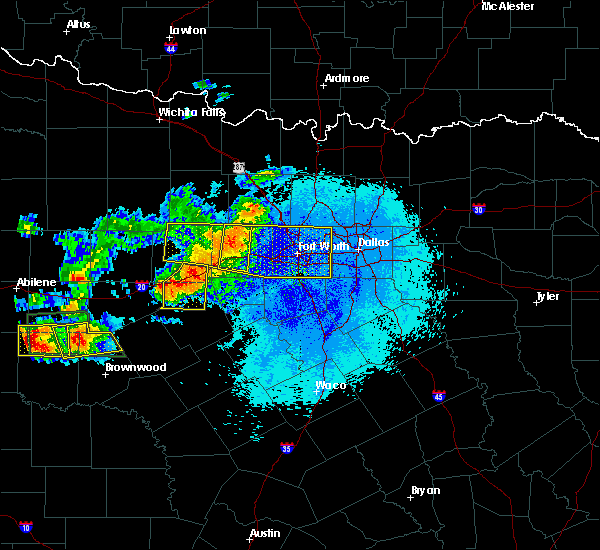 benbrook, white settlement and lake worth around 725 pm cdt. 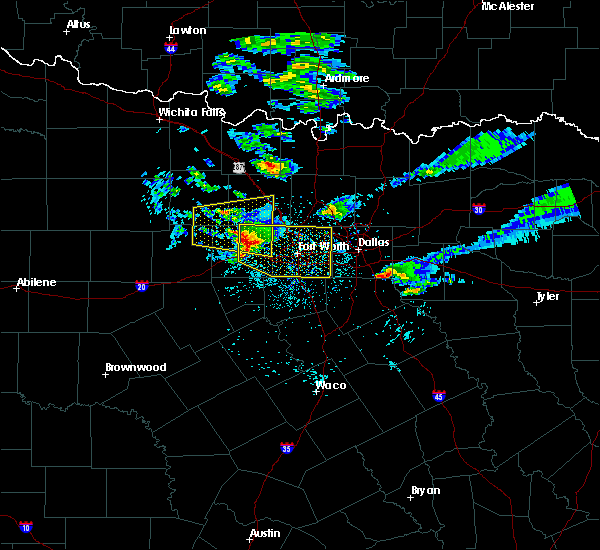 fort worth around 730 pm cdt. edgecliff village and edgecliff around 735 pm cdt. Blue mound around 740 pm cdt. 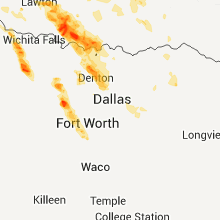 5/10/2016 6:32 PM CDT At 632 pm cdt, a severe thunderstorm was located 11 miles northeast of lipan, or 11 miles southwest of weatherford, moving northeast at 40 mph (radar indicated). Hazards include golf ball size hail and 65 mph wind gusts. People and animals outdoors will be injured. expect hail damage to roofs, siding, windows, and vehicles. expect wind damage to roofs, siding, and trees. this severe storm will be near, weatherford, hudson oaks and annetta around 655 pm cdt. 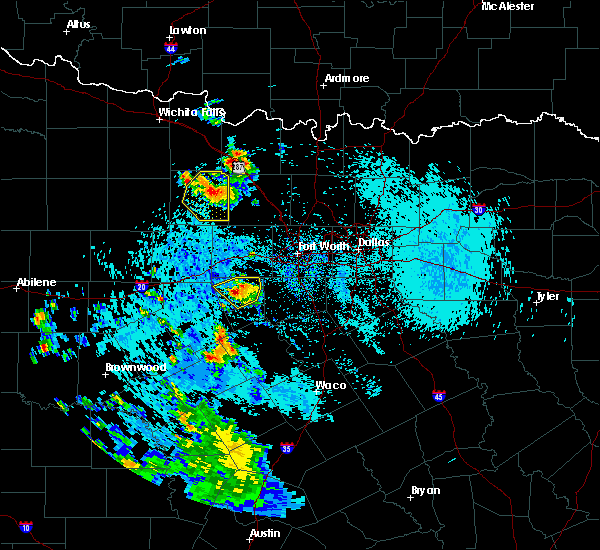 Willow park and aledo around 700 pm cdt. 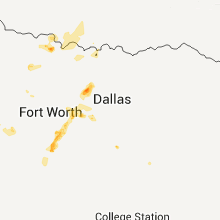 5/10/2016 6:06 PM CDT At 606 pm cdt, a severe thunderstorm was located near lipan, or 20 miles north of stephenville, moving northeast at 35 mph (radar indicated). Hazards include ping pong ball size hail and 60 mph wind gusts. People and animals outdoors will be injured. expect hail damage to roofs, siding, windows, and vehicles. Expect wind damage to roofs, siding, and trees. 4/29/2016 3:58 PM CDT At 358 pm cdt, severe thunderstorms were located along a line extending from near joshua to near cleburne state park, moving north at 45 mph (radar indicated). Hazards include 60 mph wind gusts and quarter size hail. Hail damage to vehicles is expected. expect wind damage to roofs, siding, and trees. 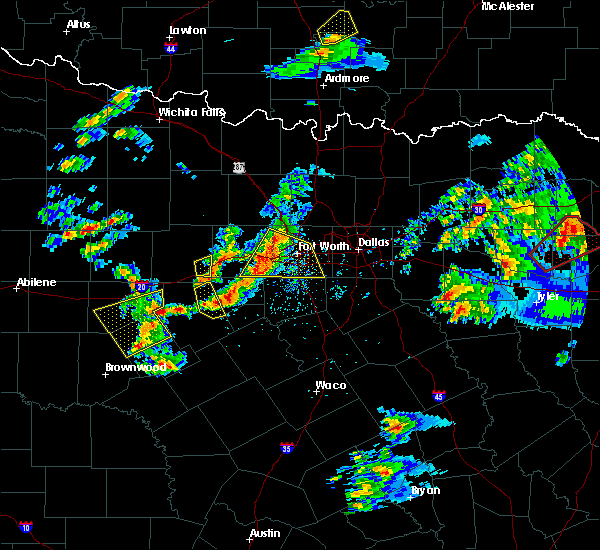 these severe storms will be near, joshua, godley and cross timber around 405 pm cdt. burleson around 410 pm cdt. A tornado watch remains in effect until 1000 pm cdt for north central texas. 4/29/2016 3:28 PM CDT At 327 pm cdt, severe thunderstorms were located along a line extending from near blum to near clifton, moving north at 45 mph (radar indicated). Hazards include 60 mph wind gusts and quarter size hail. Hail damage to vehicles is expected. expect wind damage to roofs, siding, and trees. 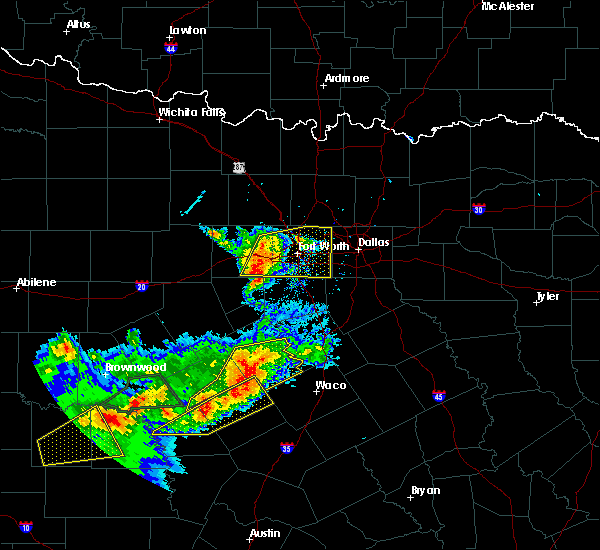 severe thunderstorms will be near, blum around 335 pm cdt. covington and meridian state park around 340 pm cdt. meridian around 345 pm cdt. keene and alvarado around 400 pm cdt. joshua and cross timber around 405 pm cdt. burleson around 410 pm cdt. cleburne state park around 415 pm cdt. mansfield around 420 pm cdt. other locations impacted by these severe thunderstorms include mount calm, morgan, rio vista, abbott, aquilla, penelope, mertens, malone, briaroaks and walnut springs. this includes the following interstates, interstate 35 between mile markers 355 and 369. interstate 35w between mile markers 1 and 37. interstate 35e between mile markers 371 and 378. A tornado watch remains in effect until 1000 pm cdt for north central texas. 4/20/2016 1:18 AM CDT At 117 am cdt, severe thunderstorms were located along a line extending from near poolville to weatherford to near oak trail shores, moving east at 40 mph (radar indicated). Hazards include 65 mph wind gusts and quarter size hail. Hail damage to vehicles is expected. expect wind damage to roofs, siding, and trees. these severe storms will be near, hudson oaks around 120 am cdt. weatherford and annetta around 125 am cdt. 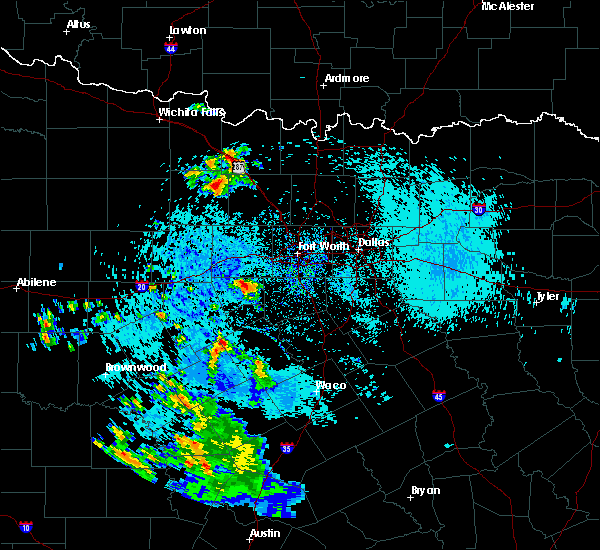 willow park and aledo around 130 am cdt. springtown around 135 am cdt. 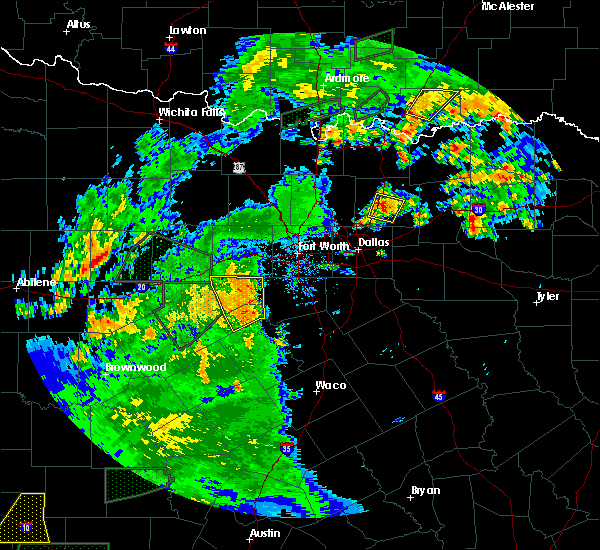 azle and briar around 145 am cdt. Other locations impacted by these severe thunderstorms include annetta north, millsap, sanctuary and annetta south. 4/20/2016 12:44 AM CDT At 1243 am cdt, severe thunderstorms were located along a line extending from near graford to 8 miles south of mineral wells to gordon, moving northeast at 30 mph (radar indicated). Hazards include 60 mph wind gusts and quarter size hail. Hail damage to vehicles is expected. expect wind damage to roofs, siding, and trees. severe thunderstorms will be near, graford around 1250 am cdt. cool and mineral wells state park around 100 am cdt. 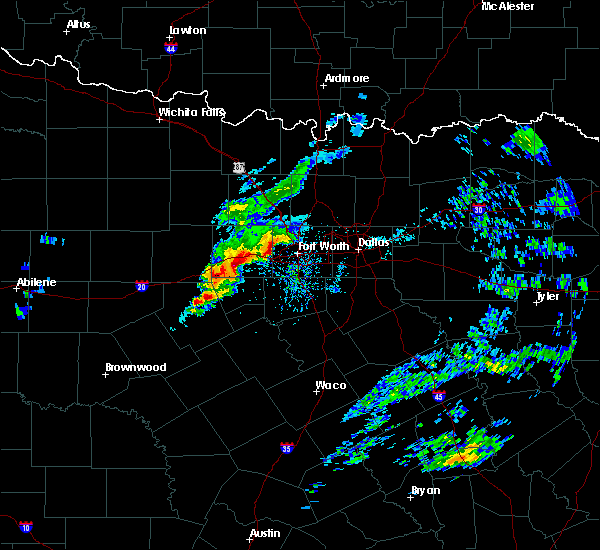 mineral wells around 105 am cdt. poolville around 120 am cdt. weatherford and hudson oaks around 130 am cdt. willow park around 135 am cdt. 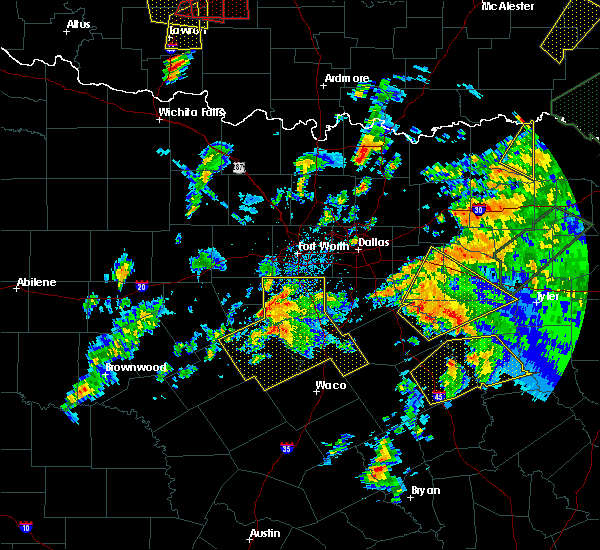 azle, briar and springtown around 145 am cdt. other locations impacted by these severe thunderstorms include annetta north, millsap, mingus, sanctuary and annetta south. this includes the following interstates, interstate 20 between mile markers 371 and 422. Interstate 30 near mile marker 1. 3/30/2016 4:43 PM CDT At 443 pm cdt, severe thunderstorms were located along a line extending from river oaks to 9 miles northwest of godley, moving east at 45 mph (radar indicated). Hazards include 60 mph wind gusts and nickel size hail. Expect damage to roofs. siding. And trees. 3/23/2016 10:26 PM CDT The severe thunderstorm warning for northwestern hood county will expire at 1030 pm cdt, the storm which prompted the warning has weakened below severe limits, and no longer pose an immediate threat to life or property. therefore the warning will be allowed to expire. however, small hail and gusty winds are still possible with this thunderstorm. 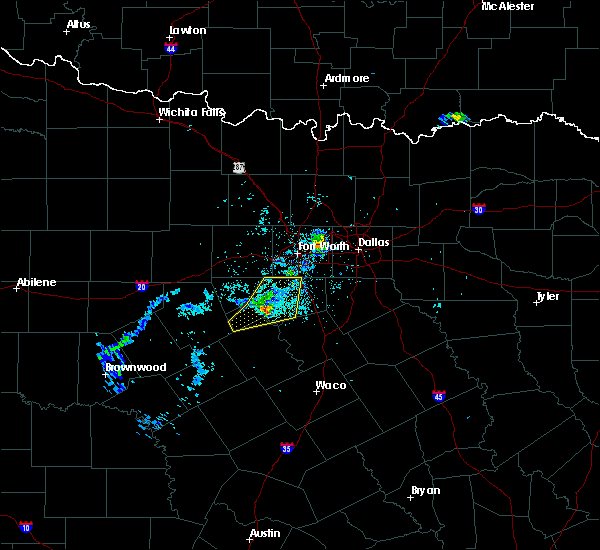 a severe thunderstorm watch remains in effect until midnight cdt for north central texas. 3/23/2016 10:19 PM CDT At 1019 pm cdt, a severe thunderstorm was located over oak trail shores, or over granbury, moving east at 35 mph (radar indicated). Hazards include 60 mph wind gusts and quarter size hail. Hail damage to vehicles is expected. expect wind damage to roofs, siding, and trees. Locations impacted include, granbury, oak trail shores and tolar. 3/23/2016 9:59 PM CDT At 958 pm cdt, a severe thunderstorm was located 7 miles northeast of oak trail shores, or 8 miles north of granbury, moving northeast at 40 mph (radar indicated). Hazards include 60 mph wind gusts and quarter size hail. Hail damage to vehicles is expected. expect wind damage to roofs, siding, and trees. Locations impacted include, weatherford, granbury, willow park, aledo, hudson oaks, annetta, lipan, oak trail shores, tolar, annetta south and annetta north. 3/23/2016 8:59 PM CDT At 858 pm cdt, a severe thunderstorm was located 10 miles northeast of lipan, or 12 miles southwest of weatherford, moving northeast at 35 mph (radar indicated). Hazards include 60 mph wind gusts and quarter size hail. Hail damage to vehicles is expected. Expect wind damage to roofs, siding, and trees. 3/17/2016 6:10 AM CDT At 610 am cdt, a severe thunderstorm was located near hudson oaks, or near weatherford, moving east at 40 mph (radar indicated). Hazards include 60 mph wind gusts and half dollar size hail. Hail damage to vehicles is expected. Expect wind damage to roofs, siding, and trees. 3/8/2016 8:13 AM CST The severe thunderstorm warning for hood, southern parker and somervell counties will expire at 815 am cst, the storms which prompted the warning have weakened below severe limits, and no longer pose an immediate threat to life or property. therefore the warning will be allowed to expire. however gusty winds are still possible with these thunderstorms. a tornado watch remains in effect until 100 pm cst for north central texas. 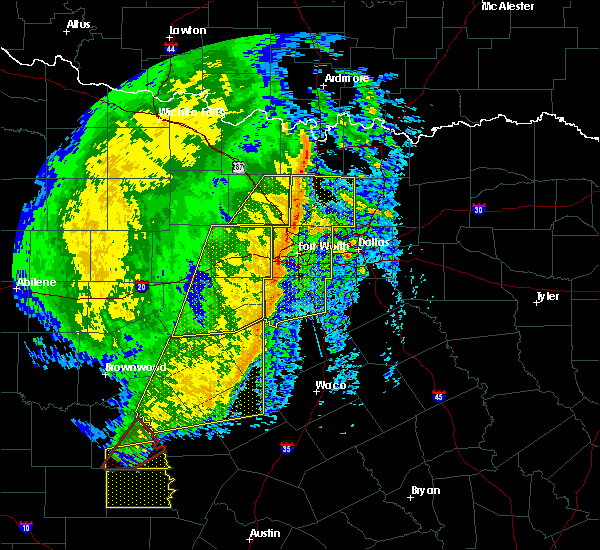 a severe thunderstorm watch remains in effect until 1100 am cst for north central texas. 3/8/2016 8:12 AM CST The tornado warning for northeastern hood, southeastern parker, northwestern johnson and southwestern tarrant counties will expire at 815 am cst, the storm which prompted the warning has moved out of the area. therefore the warning will be allowed to expire. however gusty winds are still possible with this thunderstorm. a tornado watch remains in effect until 100 pm cst for north central texas. 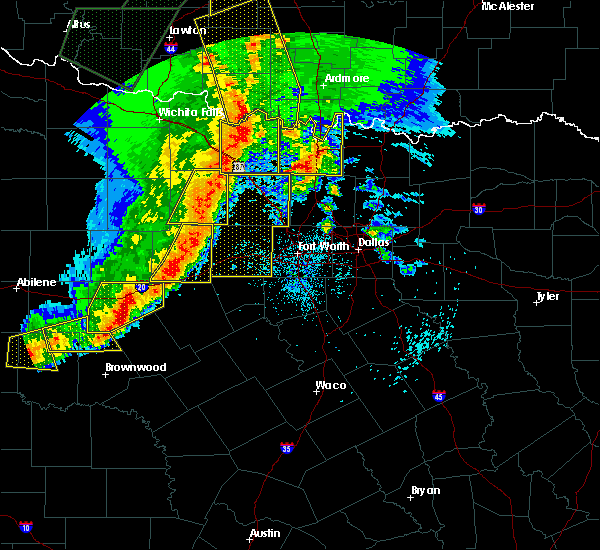 a severe thunderstorm watch remains in effect until 1100 am cst for north central texas. 3/8/2016 7:50 AM CST At 750 am cst, severe thunderstorms were located along a line extending from 6 miles northwest of godley to near cleburne state park, moving east at 50 mph (radar indicated). Hazards include 60 mph wind gusts. Expect damage to roofs. siding. And trees. 3/8/2016 7:46 AM CST At 745 am cst, a severe thunderstorm capable of producing a tornado was located 8 miles northeast of granbury, moving northeast at 40 mph. *a second storm was located about 10 miles south of weatherford, also moving northeast at 40 mph (radar indicated rotation). Hazards include tornado. Flying debris will be dangerous to those caught without shelter. mobile homes will be damaged or destroyed. damage to roofs, windows, and vehicles will occur. tree damage is likely. 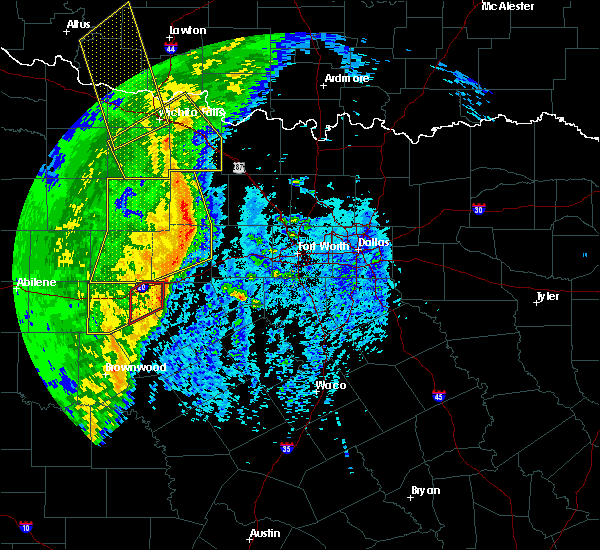 this dangerous storm will be near, godley around 755 am cst. benbrook and crowley around 815 am cst. other locations impacted by this tornadic thunderstorm include annetta north and annetta south. this includes the following interstates, interstate 20 between mile markers 412 and 428. interstate 30 between mile markers 1 and 5. Interstate 820 between mile markers 1 and 3. 3/8/2016 7:35 AM CST At 734 am cst, severe thunderstorms were located along a line extending from 7 miles southwest of weatherford to near glen rose, moving northeast at 35 mph (radar indicated). Hazards include 70 mph wind gusts. Expect considerable tree damage. damage is likely to mobile homes, roofs, and outbuildings. locations impacted include, granbury, pecan plantation, willow park, aledo, glen rose, annetta, dinosaur valley state park, oak trail shores, tolar, annetta south and annetta north. this includes interstate 20 between mile markers 390 and 391, and between mile markers 417 and 420. A tornado watch remains in effect until 100 pm cst for north central texas. 3/8/2016 7:17 AM CST At 716 am cst, a severe thunderstorm was located 9 miles southwest of granbury, moving northeast at 45 mph (radar indicated). Hazards include 60 mph wind gusts. Expect damage to roofs. siding. And trees. 11/17/2015 3:16 AM CST At 316 am cst, a severe thunderstorm was located over river oaks, moving east at 40 mph (radar indicated). Hazards include 60 mph wind gusts and penny size hail. Expect damage to roofs. siding and trees. locations impacted include, fort worth, arlington, grand prairie, mansfield, euless, bedford, grapevine, haltom city, keller, coppell, hurst, burleson, southlake, watauga, colleyville, benbrook, saginaw, white settlement, crowley and forest hill. A tornado watch remains in effect until 600 am cst for north central texas. 11/17/2015 3:01 AM CST At 300 am cst, a line of severe thunderstorms was located from near briar to anetta south, moving east at 45 mph. 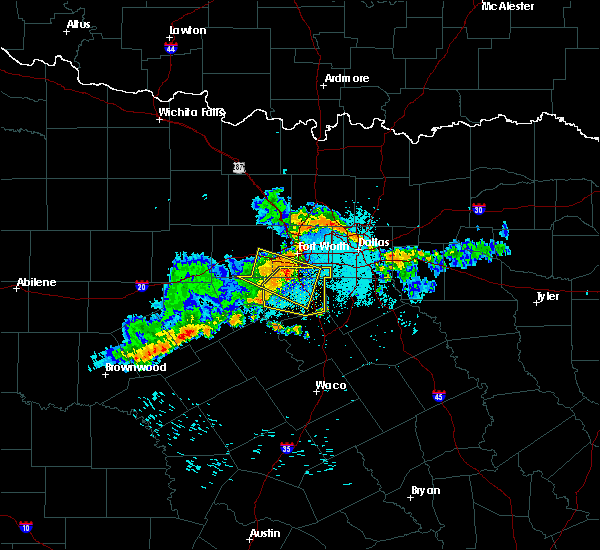 some damage was reported in southern parker county with these storms (radar indicated). Hazards include 60 mph wind gusts. Expect damage to roofs. Siding and trees. 8/25/2015 3:43 PM CDT At 343 pm cdt, a severe thunderstorm was located near granbury, moving south at 10 mph (radar indicated). Hazards include 60 mph wind gusts and quarter size hail. Hail damage to vehicles is expected. expect wind damage to roofs, siding and trees. This severe thunderstorm will remain over mainly rural areas of central hood county, including the following locations, tolar. 8/25/2015 3:25 PM CDT At 324 pm cdt, a severe thunderstorm was located near oak trail shores, or near granbury, moving southwest at 10 mph (radar indicated). Hazards include 60 mph wind gusts and penny size hail. Expect damage to roofs. siding and trees. 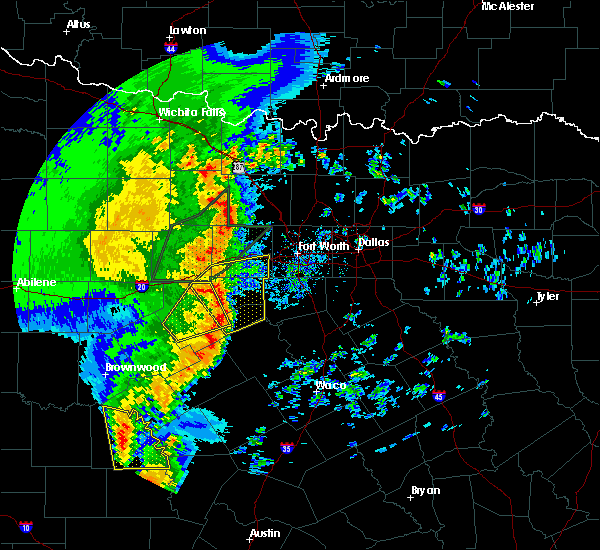 this severe thunderstorm will be near, granbury around 330 pm cdt. oak trail shores around 335 pm cdt. Other locations impacted by this severe thunderstorm include tolar. 5/27/2015 7:08 PM CDT At 708 pm cdt, a severe thunderstorm was located near willow park, or 7 miles west of white settlement, moving northeast at 30 mph (radar indicated). Hazards include 60 mph wind gusts and quarter size hail. Hail damage to vehicles is expected. Expect wind damage to roofs, siding and trees. 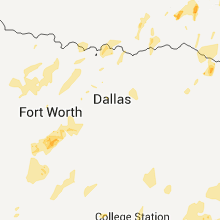 5/27/2015 6:44 PM CDT At 643 pm cdt, a severe thunderstorm was located near oak trail shores, or 8 miles north of granbury, moving northeast at 20 mph (radar indicated). Hazards include 60 mph wind gusts and quarter size hail. Hail damage to vehicles is expected. Expect wind damage to roofs, siding and trees. 5/27/2015 6:29 PM CDT At 628 pm cdt, a severe thunderstorm was located near oak trail shores, moving northeast at 25 mph (radar indicated). Hazards include 60 mph wind gusts and quarter size hail. Hail damage to vehicles is expected. Expect wind damage to roofs, siding and trees. 5/27/2015 6:16 PM CDT At 615 pm cdt, a severe thunderstorm was located near granbury, moving northeast at 25 mph (radar indicated). Hazards include 60 mph wind gusts and half dollar size hail. Hail damage to vehicles is expected. expect wind damage to roofs, siding and trees. Locations impacted include, granbury, pecan plantation, oak trail shores and tolar. 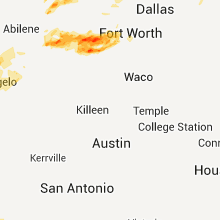 5/27/2015 5:53 PM CDT At 553 pm cdt, a severe thunderstorm was located 10 miles northwest of dinosaur valley state park, or 12 miles southwest of granbury, moving northeast at 25 mph (radar indicated). Hazards include 60 mph wind gusts and quarter size hail. Hail damage to vehicles is expected. Expect wind damage to roofs, siding and trees. 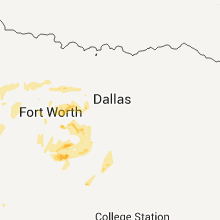 5/26/2015 10:18 PM CDT At 1018 pm cdt, a severe thunderstorm was located 9 miles north of oak trail shores, or 9 miles south of weatherford, moving east at 40 mph (radar indicated). Hazards include 60 mph wind gusts. Expect damage to roofs. siding and trees. locations impacted include, weatherford, willow park, aledo, hudson oaks, annetta, annetta south, annetta north and millsap. This includes interstate 20 between mile markers 393 and 421. 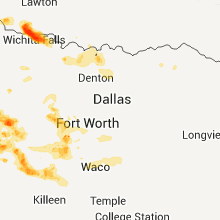 5/26/2015 9:42 PM CDT At 942 pm cdt, a severe thunderstorm was located 9 miles northeast of lipan, or 13 miles southwest of weatherford, moving east at 30 mph (radar indicated). Hazards include 60 mph wind gusts and quarter size hail. Hail damage to vehicles is expected. Expect wind damage to roofs, siding and trees. 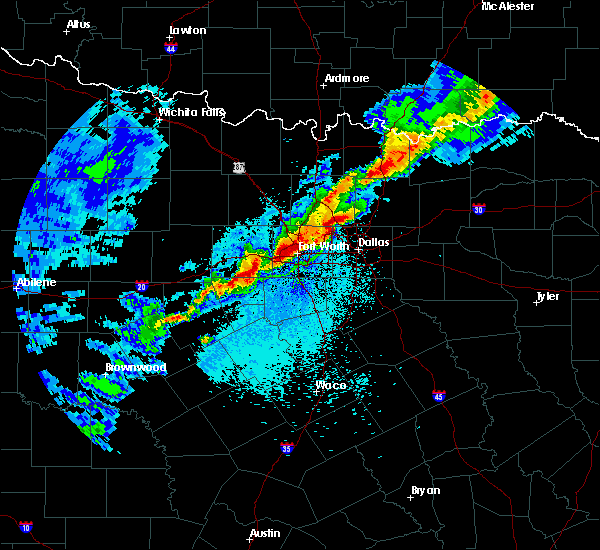 5/26/2015 9:17 PM CDT At 917 pm cdt, severe thunderstorms were located along a line extending from near lipan to 9 miles southwest of dinosaur valley state park, moving east at 15 mph (radar indicated). Hazards include 60 mph wind gusts and nickel size hail. Expect damage to roofs. Siding and trees. 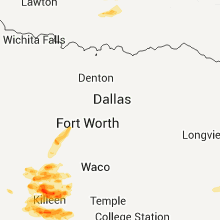 5/25/2015 2:55 PM CDT At 254 pm cdt, severe thunderstorms were located along a line extending from near willow park to keene, moving east at 55 mph (radar indicated). Hazards include 70 mph wind gusts and quarter size hail. Hail damage to vehicles is expected. expect considerable tree damage. Wind damage is also likely to mobile homes, roofs and outbuildings. 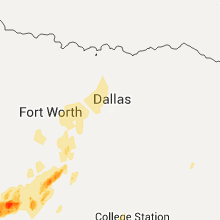 5/25/2015 2:47 PM CDT At 247 pm cdt, severe thunderstorms were located along a line extending from willow park to joshua, moving east at 45 mph (radar indicated). Hazards include 70 mph wind gusts and penny size hail. Expect considerable tree damage. damage is likely to mobile homes, roofs and outbuildings. locations impacted include, fort worth, arlington, grand prairie, mansfield, euless, bedford, grapevine, haltom city, keller, coppell, hurst, burleson, southlake, weatherford, watauga, colleyville, benbrook, saginaw, white settlement and crowley. this includes the following interstates, interstate 35w between mile markers 38 and 67. interstate 20 between mile markers 401 and 453. interstate 30 between mile markers 1 and 31. interstate 820 between mile markers 1 and 35. A tornado watch remains in effect until 600 pm cdt for north central texas. 5/25/2015 2:43 PM CDT At 242 pm cdt, a severe thunderstorm was located near godley, or near joshua, moving east at 70 mph (radar indicated). Hazards include 70 mph wind gusts and quarter size hail. Hail damage to vehicles is expected. expect considerable tree damage. wind damage is also likely to mobile homes, roofs and outbuildings. locations impacted include, mansfield, burleson, cleburne, granbury, keene, joshua, alvarado, pecan plantation, venus, grandview, godley, cross timber, oak trail shores, cleburne state park, rio vista and briaroaks. this includes interstate 35w between mile markers 15 and 37. A tornado watch remains in effect until 600 pm cdt for north central texas. 5/25/2015 2:29 PM CDT At 229 pm cdt, a severe thunderstorm was located near granbury, moving east at 70 mph (radar indicated). Hazards include 60 mph wind gusts and quarter size hail. Hail damage to vehicles is expected. Expect wind damage to roofs, siding and trees. 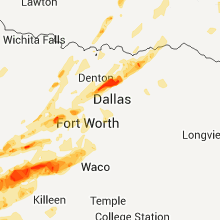 5/25/2015 2:21 PM CDT At 220 pm cdt, a severe squall line capable of producing both tornadoes and extensive straight line wind damage was located over oak trail shores, or near granbury, moving northeast at 70 mph (radar indicated rotation). Hazards include tornado. Flying debris will be dangerous to those caught without shelter. mobile homes will be damaged or destroyed. damage to roofs, windows and vehicles will occur. tree damage is likely. This tornadic thunderstorm will remain over mainly rural areas of hood and northeastern erath counties, including the following locations, tolar. 5/25/2015 2:10 PM CDT At 208 pm cdt, severe thunderstorms were located along a line extending from near reno to 6 miles southwest of annetta, moving east at 40 mph (radar indicated). Hazards include 70 mph wind gusts and penny size hail. Expect considerable tree damage. damage is likely to mobile homes, roofs and outbuildings. locations impacted include, fort worth, arlington, grand prairie, mansfield, euless, bedford, grapevine, haltom city, keller, coppell, hurst, burleson, southlake, weatherford, watauga, colleyville, benbrook, saginaw, white settlement and crowley. this includes the following interstates, interstate 35w between mile markers 38 and 67. interstate 20 between mile markers 398 and 453. interstate 30 between mile markers 1 and 31. interstate 820 between mile markers 1 and 35. A tornado watch remains in effect until 600 pm cdt for north central texas. 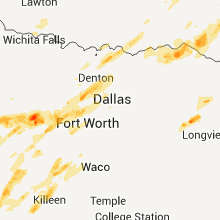 5/25/2015 2:06 PM CDT At 206 pm cdt, severe thunderstorms capable of producing both tornadoes and extensive straight line wind damage were located 9 miles southeast of morgan mill, or 12 miles northeast of stephenville, moving northeast at 55 mph (radar indicated rotation). Hazards include tornado. Flying debris will be dangerous to those caught without shelter. mobile homes will be damaged or destroyed. damage to roofs, windows and vehicles will occur. tree damage is likely. these dangerous storms will be near, oak trail shores around 225 pm cdt. 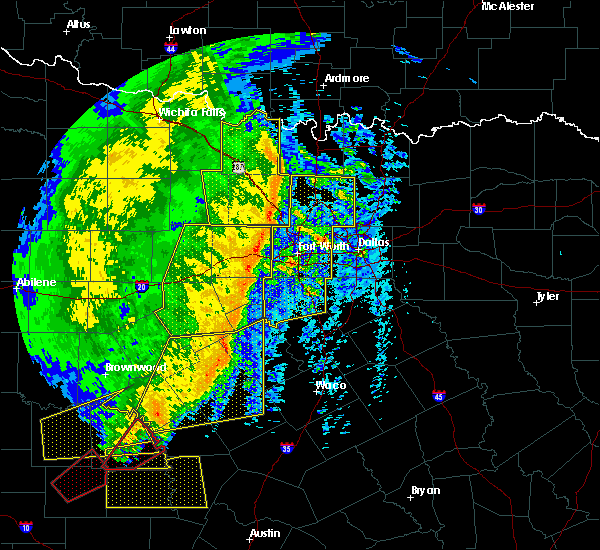 Other locations impacted by this tornadic thunderstorm include tolar. 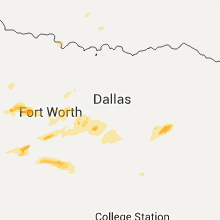 5/25/2015 1:41 PM CDT At 141 pm cdt, severe thunderstorms were located along a line extending from near springtown to near oak trail shores, moving east at 30 mph (radar indicated). Hazards include 60 mph wind gusts and penny size hail. Expect damage to roofs. Siding and trees. 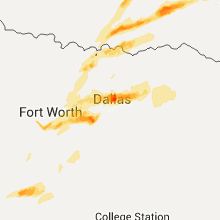 5/25/2015 1:23 PM CDT At 122 pm cdt, severe thunderstorms were located along a line extending from near poolville to 8 miles northeast of lipan, moving east at 40 mph (radar indicated). Hazards include 70 mph wind gusts and penny size hail. Expect considerable tree damage. damage is likely to mobile homes, roofs and outbuildings. locations impacted include, weatherford, mineral wells, azle, briar, willow park, reno, aledo, springtown, hudson oaks, annetta, cool, poolville, mineral wells state park, annetta south, annetta north, millsap and sanctuary. this includes the following interstates, interstate 20 between mile markers 390 and 422. interstate 30 near mile marker 1. A tornado watch remains in effect until 600 pm cdt for north central texas. 5/25/2015 12:46 PM CDT At 1246 pm cdt, severe thunderstorms were located along a line extending from near graford to 9 miles northeast of gordon, moving east at 45 mph (radar indicated). Hazards include 70 mph wind gusts and penny size hail. Expect considerable tree damage. Damage is likely to mobile homes, roofs and outbuildings. 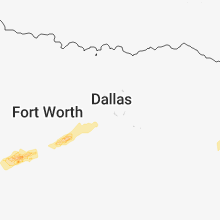 5/17/2015 12:23 AM CDT The severe thunderstorm warning for eastern parker county will expire at 1230 am cdt, the storms which prompted the warning have moved out of the warned area. therefore the warning will be allowed to expire. heavy rain will be possible in the wake of these storms. 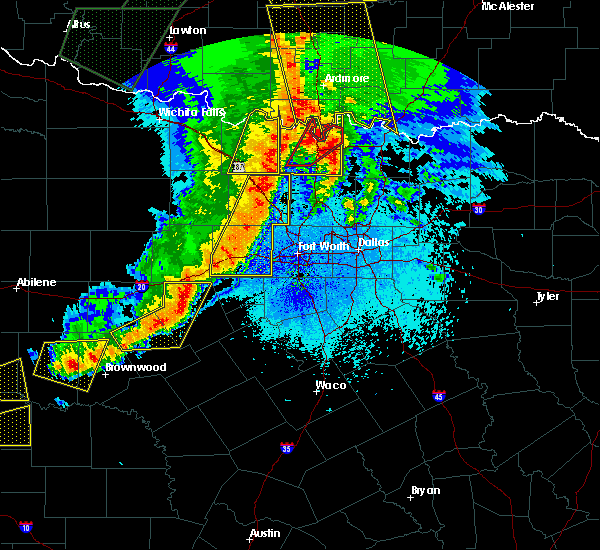 5/17/2015 12:15 AM CDT At 1214 am cdt, severe thunderstorms were located along a line extending from near boyd to near aurora to near pecan acres to lakeside to near aledo, moving east at 60 mph (radar indicated). Hazards include 70 mph wind gusts. Expect considerable tree damage. damage is likely to mobile homes, roofs and outbuildings. locations impacted include, weatherford, azle, briar, willow park, reno, aledo, springtown, hudson oaks, annetta, poolville, annetta south, annetta north and sanctuary. this includes the following interstates, interstate 20 between mile markers 406 and 422. interstate 30 near mile marker 1. 75in. 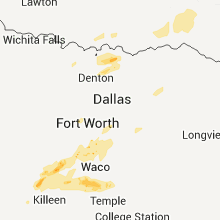 5/16/2015 11:52 PM CDT At 1150 pm cdt, severe thunderstorms were located along a line extending from 8 miles north of mineral wells state park to 7 miles southwest of poolville to near weatherford to 7 miles northeast of lipan, moving east at 60 mph (radar indicated). Hazards include 60 mph wind gusts. Expect damage to roofs. siding and trees. locations impacted include, weatherford, mineral wells, azle, briar, willow park, reno, aledo, springtown, hudson oaks, annetta, graford, gordon, cool, poolville, mineral wells state park, annetta south, annetta north, millsap and sanctuary. this includes the following interstates, interstate 20 between mile markers 368 and 422. interstate 30 near mile marker 1. Possible. 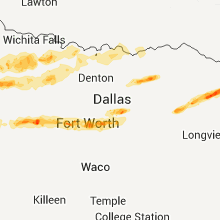 5/16/2015 11:31 PM CDT At 1130 pm cdt, severe thunderstorms were located along a line extending from near graford to 11 miles south of mineral wells to 8 miles north of morgan mill, moving east at 50 mph (radar indicated). Hazards include 60 mph wind gusts. Expect damage to roofs. Siding and trees. 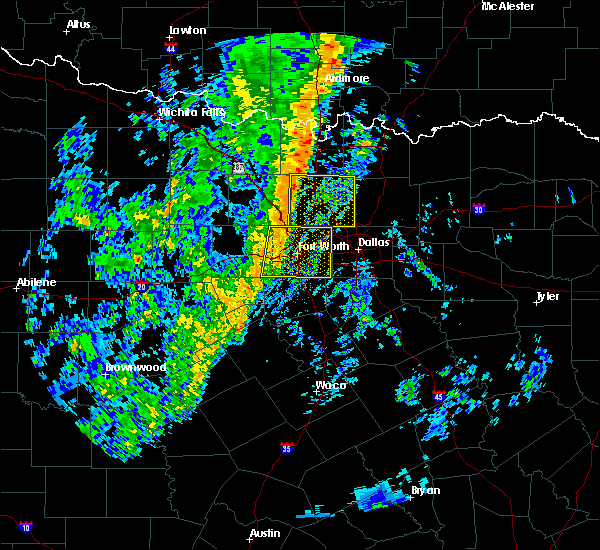 5/10/2015 6:08 AM CDT At 608 am cdt, severe thunderstorms were located along a line extending from reno to near benbrook to near cleburne state park, moving east at 45 mph (radar indicated). Hazards include 60 mph wind gusts. Expect damage to roofs. siding and trees. locations impacted include, weatherford, azle, granbury, briar, pecan plantation, willow park, reno, aledo, springtown, glen rose, hudson oaks, annetta, oak trail shores, poolville, dinosaur valley state park, annetta south, annetta north and sanctuary. 75in. 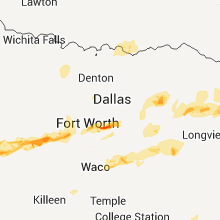 5/10/2015 5:45 AM CDT At 545 am cdt, severe thunderstorms were located along a line extending from 10 miles northwest of weatherford to 5 miles south of annetta to glen rose, moving east at 45 mph (radar indicated). Hazards include 60 mph wind gusts. Expect damage to roofs. siding and trees. locations impacted include, weatherford, mineral wells, azle, granbury, briar, pecan plantation, willow park, reno, aledo, springtown, glen rose, hudson oaks, annetta, lipan, cool, oak trail shores, poolville, dinosaur valley state park, mineral wells state park and tolar. 75in. 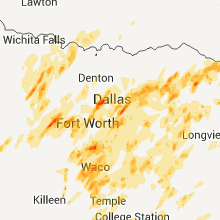 5/10/2015 5:15 AM CDT At 515 am cdt, severe thunderstorms were located along a line extending from 10 miles southwest of mineral wells to near lipan to 10 miles north of hico, moving east at 45 mph (radar indicated). Hazards include 60 mph wind gusts. Expect damage to roofs. Siding and trees. 5/9/2015 11:54 PM CDT At 1153 pm cdt, a severe thunderstorm was located near pecan plantation, or 11 miles east of granbury, moving east at 25 mph. this is a very dangerous storm (radar indicated). Hazards include softball size hail and 60 mph wind gusts. People and animals outdoors will be severely injured. expect shattered windows, extensive damage to roofs, siding and vehicles. locations impacted include, mansfield, burleson, cleburne, granbury, keene, joshua, alvarado, pecan plantation, venus, glen rose, grandview, godley, cross timber, cleburne state park, rio vista and briaroaks. this includes interstate 35w between mile markers 14 and 37. 4. 25in. 5/9/2015 11:42 PM CDT At 1141 pm cdt, a severe thunderstorm was located near granbury, moving east at 30 mph (radar indicated). Hazards include tennis ball size hail and 60 mph wind gusts. People and animals outdoors will be injured. expect hail damage to roofs, siding, windows and vehicles. Expect wind damage to roofs, siding and trees. 5/9/2015 11:33 PM CDT At 1133 pm cdt, a severe thunderstorm was located near granbury, moving east at 20 mph (radar indicated). Hazards include tennis ball size hail and 60 mph wind gusts. People and animals outdoors will be injured. expect hail damage to roofs, siding, windows and vehicles. expect wind damage to roofs, siding and trees. locations impacted include, granbury, pecan plantation, lipan, oak trail shores and tolar. 2. 50in. 5/9/2015 11:12 PM CDT The severe thunderstorm warning for northwestern johnson county will expire at 1115 pm cdt, the storm which prompted the warning has weakened below severe limits, and no longer pose an immediate threat to life or property. therefore the warning will be allowed to expire. however heavy rain is still possible with this thunderstorm. 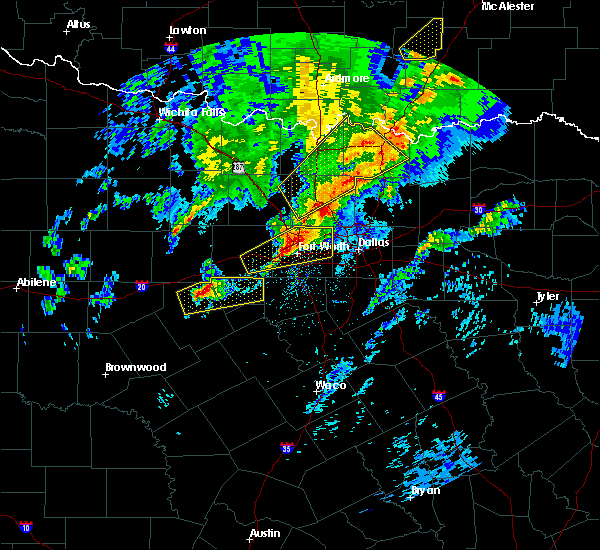 a severe thunderstorm watch remains in effect until 300 am cdt for north central texas. 5/9/2015 10:46 PM CDT At 1044 pm cdt, a severe thunderstorm was located over pecan plantation, or 8 miles southeast of granbury, moving northeast at 30 mph (radar indicated). Hazards include ping pong ball size hail and 60 mph wind gusts. People and animals outdoors will be injured. expect hail damage to roofs, siding, windows and vehicles. expect wind damage to roofs, siding and trees. locations impacted include, cleburne, joshua and godley. a tornado watch remains in effect until 1100 pm cdt for north central texas. 1. 50in. 5/9/2015 10:42 PM CDT At 1042 pm cdt, a severe thunderstorm was located near morgan mill, or 15 miles northeast of stephenville, moving east at 35 mph (radar indicated). Hazards include 60 mph wind gusts and half dollar size hail. Hail damage to vehicles is expected. Expect wind damage to roofs, siding and trees. 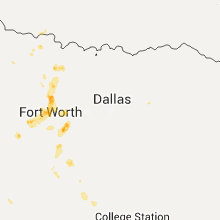 5/9/2015 10:15 PM CDT At 1014 pm cdt, a severe thunderstorm was located near dinosaur valley state park, or 10 miles south of granbury, moving northeast at 30 mph (radar indicated). Hazards include ping pong ball size hail and 60 mph wind gusts. People and animals outdoors will be injured. expect hail damage to roofs, siding, windows and vehicles. Expect wind damage to roofs, siding and trees. 5/9/2015 9:10 PM CDT At 909 pm cdt, a severe thunderstorm was located 7 miles north of godley, or 8 miles west of crowley, moving east at 25 mph (radar indicated). Hazards include 60 mph wind gusts and quarter size hail. Hail damage to vehicles is expected. expect wind damage to roofs, siding and trees. locations impacted include, fort worth, burleson, cleburne, benbrook, crowley, granbury, everman, keene, joshua, rendon, pecan plantation, edgecliff village, aledo, annetta, godley, cross timber, oak trail shores, edgecliff, tolar and annetta south. 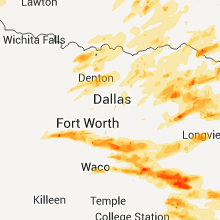 this includes the following interstates, interstate 35w between mile markers 28 and 43. interstate 20 between mile markers 420 and 431. interstate 30 between mile markers 1 and 4. interstate 820 between mile markers 1 and 2. a tornado watch remains in effect until 1100 pm cdt for north central texas. 1. 00in. 5/9/2015 8:40 PM CDT At 839 pm cdt, a severe thunderstorm was located near granbury, moving east at 25 mph (radar indicated). Hazards include ping pong ball size hail and 60 mph wind gusts. People and animals outdoors will be injured. expect hail damage to roofs, siding, windows and vehicles. Expect wind damage to roofs, siding and trees. 5/9/2015 8:23 PM CDT At 822 pm cdt, a severe thunderstorm was located over granbury, moving northeast at 30 mph (radar indicated). Hazards include tennis ball size hail and 60 mph wind gusts. People and animals outdoors will be injured. expect hail damage to roofs, siding, windows and vehicles. expect wind damage to roofs, siding and trees. locations impacted include, granbury, pecan plantation, glen rose, lipan, dinosaur valley state park, oak trail shores and tolar. this includes interstate 20 between mile markers 390 and 392. a tornado watch remains in effect until 900 pm cdt for north central texas. Possible. 4/26/2015 9:27 PM CDT At 926 pm cdt, a severe thunderstorm was located 7 miles south of lipan, or 12 miles west of granbury, moving east at 20 mph (radar indicated). Hazards include ping pong ball size hail and 60 mph wind gusts. People and animals outdoors will be injured. expect hail damage to roofs, siding, windows and vehicles. expect wind damage to roofs, siding and trees. locations impacted include, weatherford, granbury, pecan plantation, willow park, aledo, hudson oaks, annetta, lipan, oak trail shores, morgan mill, tolar, annetta south, annetta north and millsap. this includes interstate 20 between mile markers 381 and 418. a tornado watch remains in effect until 1100 pm cdt for north central texas. 1. 50in. 4/26/2015 8:43 PM CDT At 842 pm cdt, a severe thunderstorm was located near lipan, or 19 miles west of granbury, moving east at 25 mph (radar indicated). Hazards include tennis ball size hail and 60 mph wind gusts. People and animals outdoors will be injured. expect hail damage to roofs, siding, windows and vehicles. Expect wind damage to roofs, siding and trees. 4/26/2015 8:12 PM CDT The severe thunderstorm warning for northeastern hood, southeastern parker and northwestern johnson counties will expire at 815 pm cdt, the storm which prompted the warning has weakened below severe limits, and no longer pose an immediate threat to life or property. therefore the warning will be allowed to expire. however small hail and gusty winds are still possible with this thunderstorm. a tornado watch remains in effect until 1100 pm cdt for north central texas. 4/26/2015 7:56 PM CDT At 756 pm cdt, a severe thunderstorm was located near granbury, moving northeast at 30 mph (radar indicated). Hazards include golf ball size hail and 70 mph wind gusts. People and animals outdoors will be injured. expect hail damage to roofs, siding, windows and vehicles. expect considerable tree damage. wind damage is also likely to mobile homes, roofs and outbuildings. locations impacted include, cleburne, granbury, joshua, pecan plantation, godley, oak trail shores and annetta south. a tornado watch remains in effect until 1100 pm cdt for north central texas. 1. 75in. 4/26/2015 7:33 PM CDT At 733 pm cdt, a severe thunderstorm was located near granbury, moving east at 35 mph (radar indicated). Hazards include golf ball size hail and 70 mph wind gusts. People and animals outdoors will be injured. expect hail damage to roofs, siding, windows and vehicles. expect considerable tree damage. Wind damage is also likely to mobile homes, roofs and outbuildings. 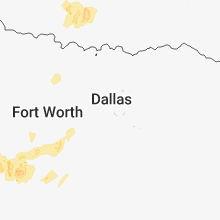 4/26/2015 7:20 PM CDT At 720 pm cdt, a severe thunderstorm was located 11 miles east of morgan mill, or 12 miles southwest of granbury, moving northeast at 30 mph. this is a very dangerous storm (radar indicated). Hazards include baseball size hail and 70 mph wind gusts. People and animals outdoors will be severely injured. expect shattered windows, extensive damage to roofs, siding and vehicles. locations impacted include, granbury, pecan plantation, glen rose, dinosaur valley state park, oak trail shores and tolar. a tornado watch remains in effect until 1100 pm cdt for north central texas. 2. 75in. 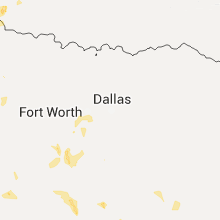 4/26/2015 7:10 PM CDT At 710 pm cdt, a severe thunderstorm was located 11 miles northwest of dinosaur valley state park, or 12 miles southwest of granbury, moving northeast at 35 mph. this is a very dangerous storm (radar indicated). Hazards include baseball size hail and 70 mph wind gusts. People and animals outdoors will be severely injured. expect shattered windows, extensive damage to roofs, siding and vehicles. locations impacted include, granbury, pecan plantation, glen rose, dinosaur valley state park, morgan mill, oak trail shores and tolar. a tornado watch remains in effect until 1100 pm cdt for north central texas. 2. 75in. 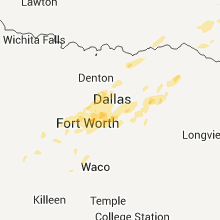 4/24/2015 6:16 PM CDT At 615 pm cdt, a severe thunderstorm was located near aledo, or near benbrook, moving east at 60 mph. this is a very dangerous storm (radar indicated). Hazards include 90 mph wind gusts and quarter size hail. You are in a life-threatening situation. flying debris may be deadly to those caught without shelter. mobile homes will be heavily damaged or destroyed. homes and businesses will have substantial roof and window damage. expect extensive tree damage and power outages. locations impacted include, fort worth, arlington, grand prairie, mansfield, euless, bedford, haltom city, hurst, burleson, cleburne, benbrook, white settlement, crowley, forest hill, richland hills, river oaks, kennedale, everman, keene and joshua. a tornado watch remains in effect until 1000 pm cdt for north central texas. 1. 00in. 4/24/2015 6:03 PM CDT At 603 pm cdt, severe thunderstorms were located along a line extending from 7 miles south of weatherford to near glen rose, moving east at 55 mph. these are very dangerous storms (radar indicated). Hazards include 80 mph wind gusts and ping pong ball size hail. Flying debris will be dangerous to those caught without shelter. mobile homes will be heavily damaged. expect considerable damage to roofs, windows and vehicles. Extensive tree damage and power outages are likely. 4/24/2015 5:37 PM CDT At 536 pm cdt, a severe thunderstorm was located 8 miles east of stephenville, moving east at 55 mph. this is a very dangerous storm (radar indicated). Hazards include 80 mph wind gusts and ping pong ball size hail. Flying debris will be dangerous to those caught without shelter. mobile homes will be heavily damaged. expect considerable damage to roofs, windows and vehicles. Extensive tree damage and power outages are likely. 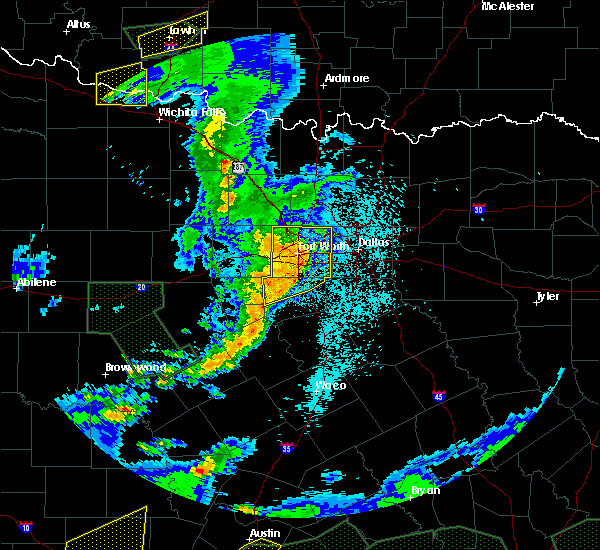 4/18/2015 7:37 PM CDT At 736 pm cdt, severe thunderstorms were located along a line extending from saginaw to near richland hills to near rendon, moving east at 45 mph. a 66 mph wind gust was reported at the naval air station (radar indicated). Hazards include 70 mph wind gusts. Expect considerable tree damage. damage is likely to mobile homes, roofs and outbuildings. Possible. 4/18/2015 7:23 PM CDT The severe thunderstorm warning for hood and somervell counties will expire at 730 pm cdt, the storms which prompted the warning have weakened. therefore the warning will be allowed to expire. 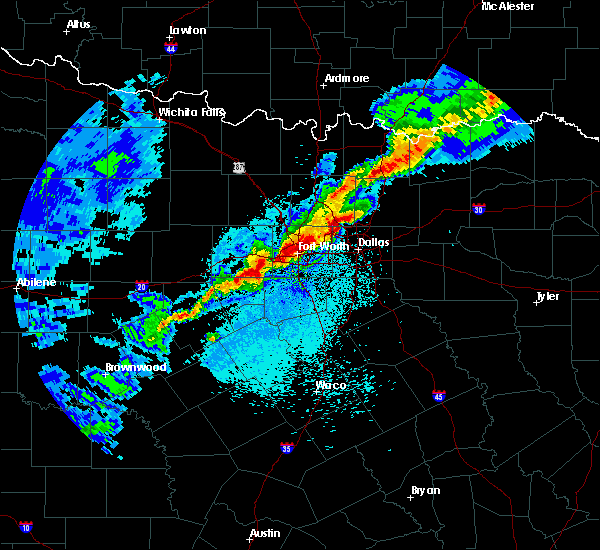 4/18/2015 7:11 PM CDT At 708 pm cdt, severe thunderstorms were located along a line extending from willow park to near benbrook to near godley, moving northeast at 55 mph. these are very dangerous storms (radar indicated). 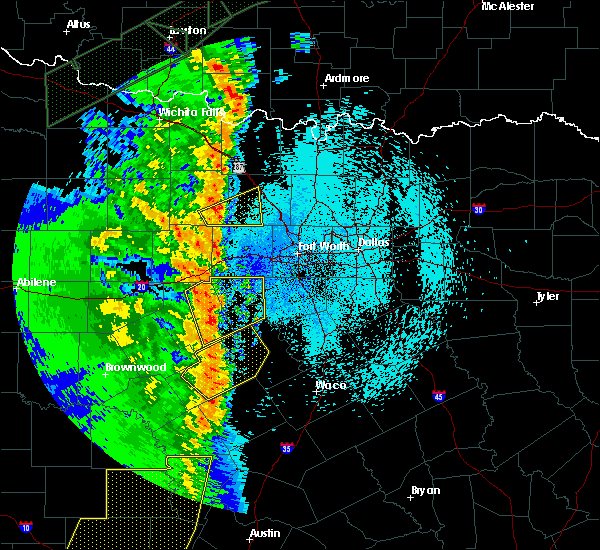 Hazards include 80 mph wind gusts entering southwestern tarrant county and northwestern johnson counties. 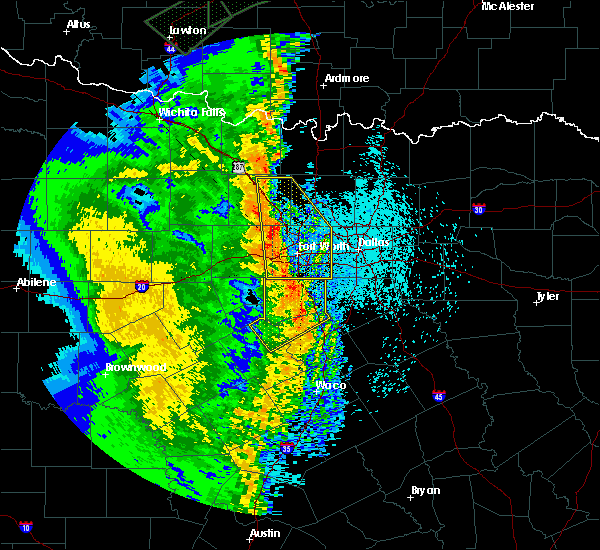 the core of these strong winds will track across the greater fort worth area. Flying debris will be dangerous to those caught without shelter. mobile homes may be heavily damaged. expect considerable damage to roofs, windows and vehicles. extensive tree damage and power outages are likely. 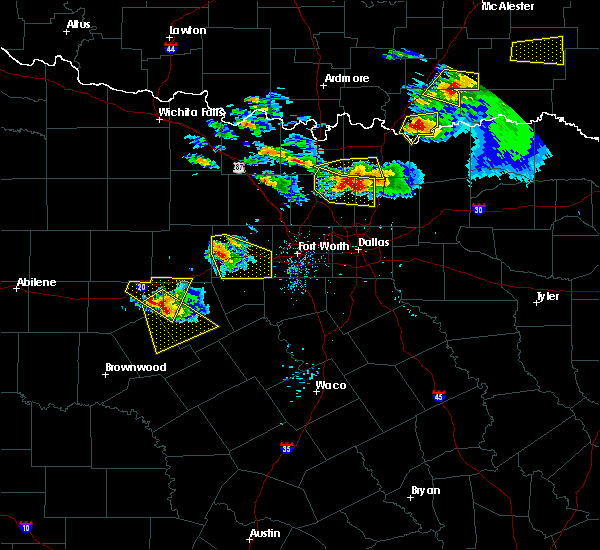 these severe storms will be near, benbrook around 715 pm cdt. 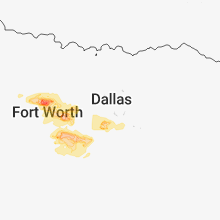 burleson, white settlement, crowley, edgecliff village, westworth village, lakeside, cross timber, edgecliff and westworth around 720 pm cdt. 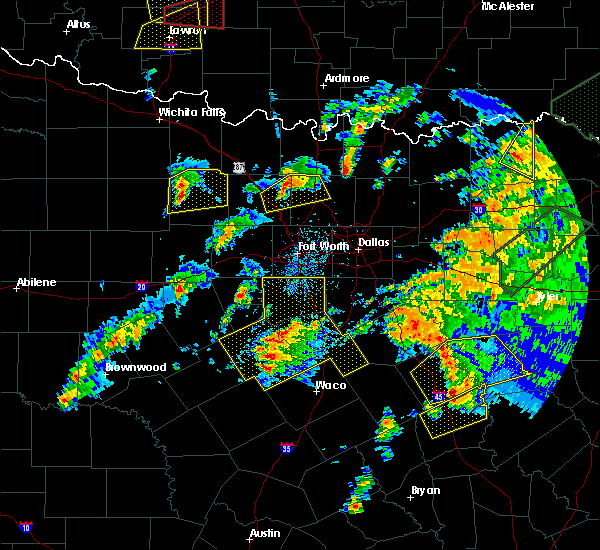 forest hill, river oaks, kennedale, everman, sansom park, lake worth, eagle mountain and pelican bay around 725 pm cdt. 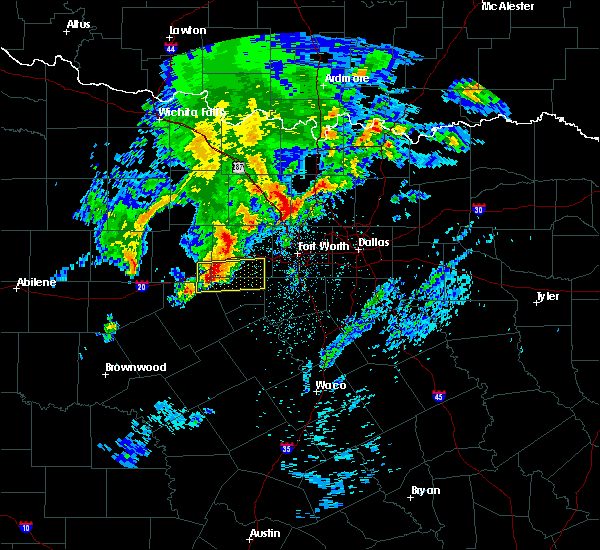 saginaw, richland hills, rendon, blue mound, pantego, dalworthington gardens and dalworthington gar around 730 pm cdt. 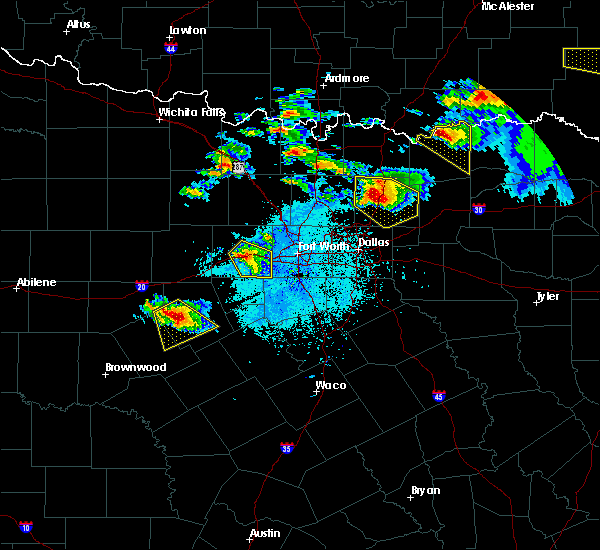 mansfield, bedford, haltom city, watauga, north richland hil and haslet around 735 pm cdt. 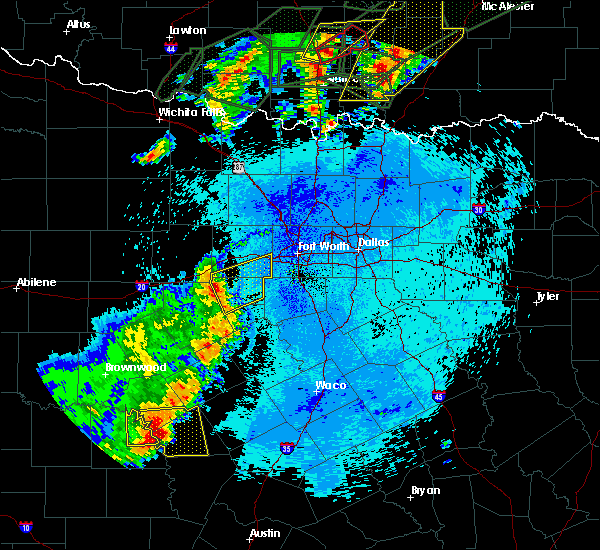 fort worth, arlington, grand prairie, euless, keller, hurst and north richland hills around 740 pm cdt. 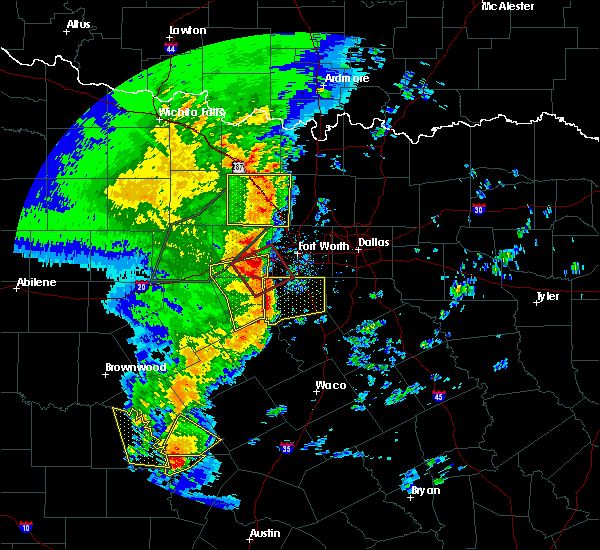 grapevine, southlake and colleyville around 745 pm cdt. other locations impacted by these severe thunderstorms include rio vista, briaroaks, westover hills, westlake and newark. Possible. 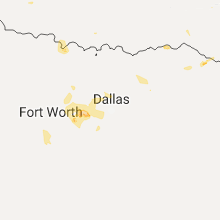 4/18/2015 6:58 PM CDT At 657 pm cdt, severe thunderstorms were located along a line extending from 7 miles south of poolville to 8 miles south of annetta, moving east at 55 mph (radar indicated). Hazards include 70 mph wind gusts and half dollar size hail. 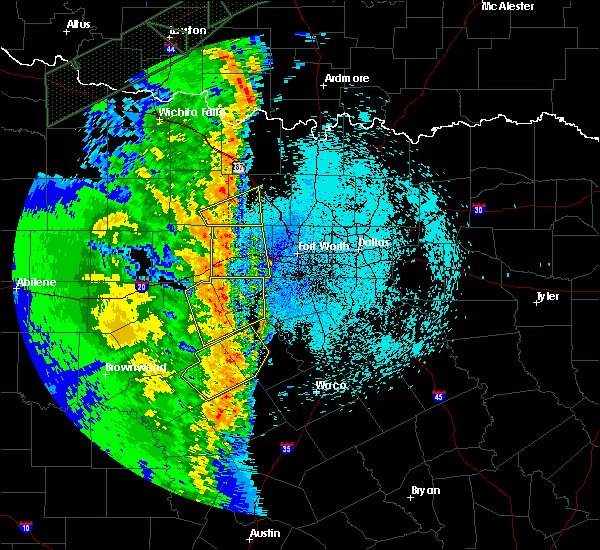 the strongest winds will affect the area south of i-20. Hail damage to vehicles is expected. expect considerable tree damage. wind damage is also likely to mobile homes, roofs and outbuildings. locations impacted include, weatherford, mineral wells, azle, briar, willow park, reno, aledo, springtown, hudson oaks, annetta, cool, poolville, mineral wells state park, annetta south, annetta north, millsap and sanctuary. Possible. 4/18/2015 6:53 PM CDT At 651 pm cdt, severe thunderstorms were located along a line extending from near weatherford to near pecan plantation, moving east at 45 mph (radar indicated). 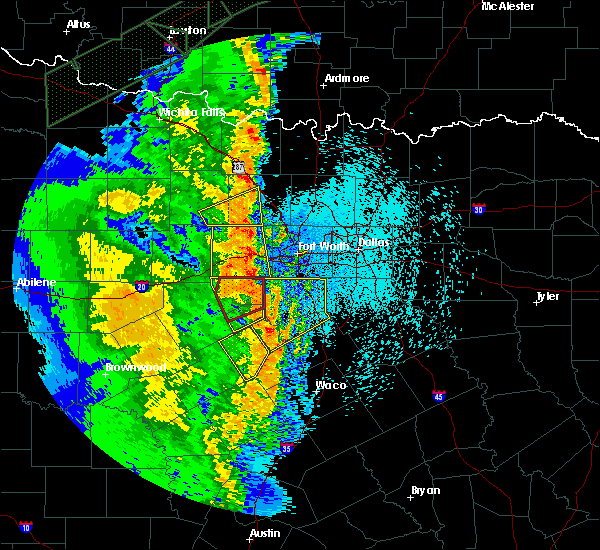 Hazards include 70 mph wind gusts...especially across southern tarrant and northeastern johnson counties. Expect considerable tree damage. damage is likely to mobile homes, roofs and outbuildings. 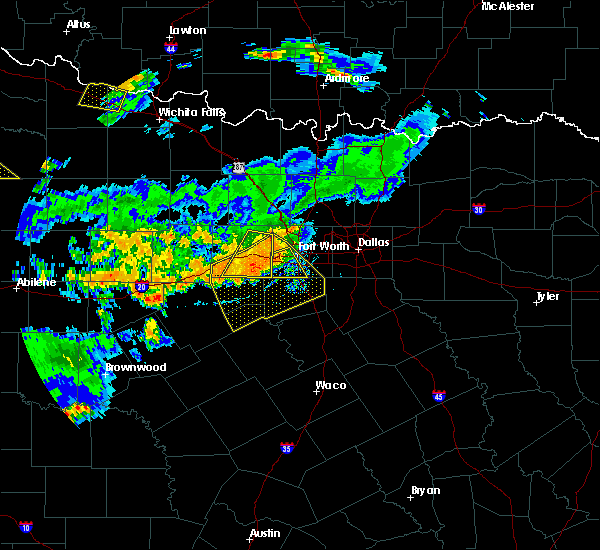 severe thunderstorms will be near, godley around 700 pm cdt. cleburne around 710 pm cdt. benbrook, keene, joshua and lakeside around 715 pm cdt. 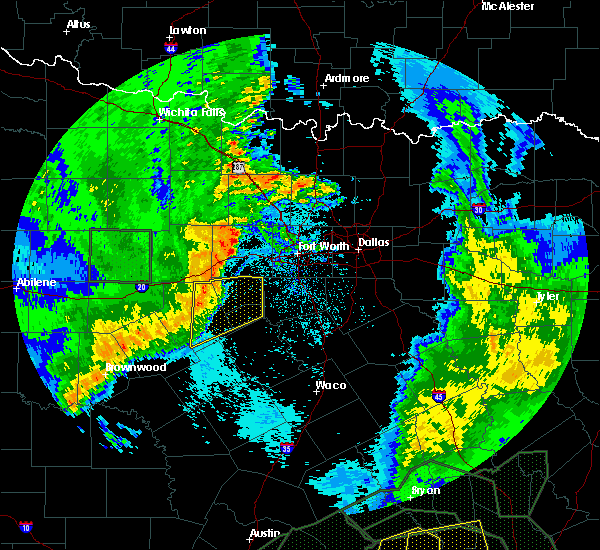 burleson, white settlement, crowley, lake worth, westworth village, cross timber and westworth around 720 pm cdt. saginaw, river oaks, sansom park and alvarado around 725 pm cdt. rendon, blue mound and haslet around 730 pm cdt. 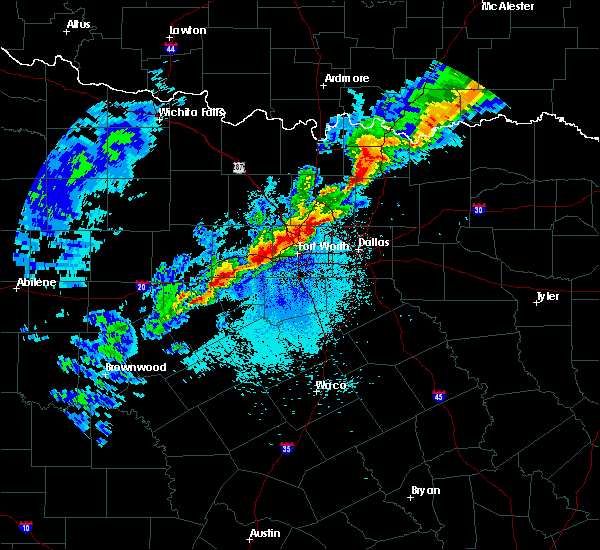 mansfield, haltom city, watauga and richland hills around 735 pm cdt. 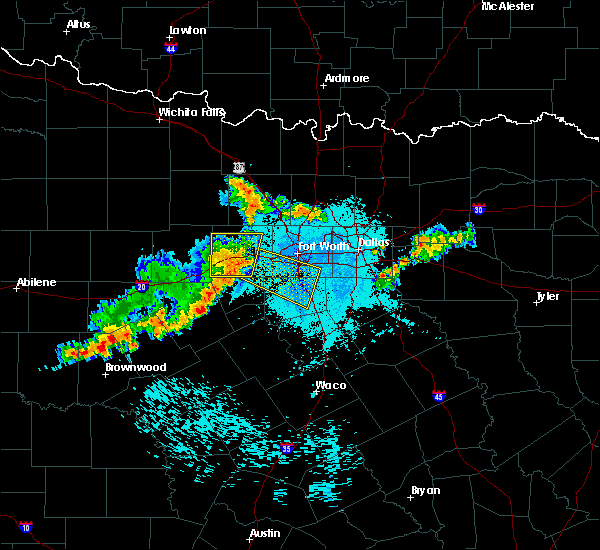 hurst, north richland hil and north richland hills around 740 pm cdt. other locations impacted by these severe thunderstorms include rio vista, briaroaks, westover hills, westlake and newark. Possible. 4/18/2015 6:44 PM CDT The national weather service in fort worth has issued a * tornado warning for. northern hood county in north central texas. southern parker county in north central texas. until 715 pm cdt * at 643 pm cdt. A severe thunderstorm capable of producing a. 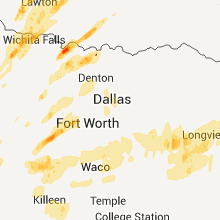 4/18/2015 6:41 PM CDT At 641 pm cdt, severe thunderstorms were located along a line extending from 6 miles southwest of springtown to near lipan, moving east at 35 mph (radar indicated). Hazards include 60 mph wind gusts and half dollar size hail. Hail damage to vehicles is expected. Expect wind damage to roofs, siding and trees. 4/18/2015 6:33 PM CDT At 632 pm cdt, severe thunderstorms were located along a line extending from lipan to 9 miles southwest of granbury to 10 miles west of dinosaur valley state park, moving east at 55 mph (radar indicated). Hazards include 70 mph wind gusts. Expect considerable tree damage. damage is likely to mobile homes, roofs and outbuildings. locations impacted include, granbury, pecan plantation, glen rose, lipan, dinosaur valley state park, oak trail shores and tolar. 75in. 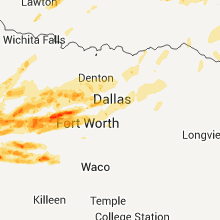 4/18/2015 6:24 PM CDT At 623 pm cdt, severe thunderstorms were located along a line extending from near lipan to 10 miles southeast of morgan mill to 6 miles east of stephenville, moving east at 50 mph (radar indicated). Hazards include 60 mph wind gusts. Expect damage to roofs. Siding and trees.